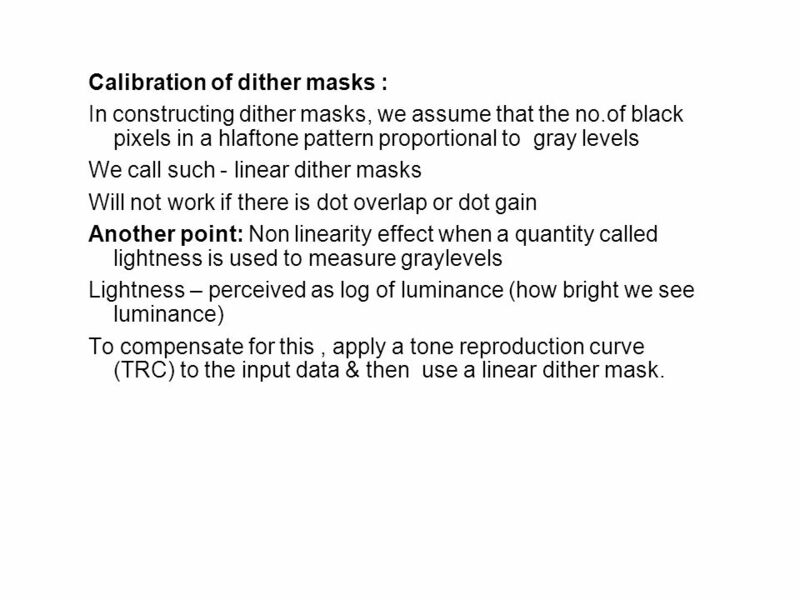 In constructing dither masks, we assume that the no.of black pixels in a hlaftone pattern proportional to gray levels We call such - linear dither masks Will not work if there is dot overlap or dot gain Another point: Non linearity effect when a quantity called lightness is used to measure graylevels Lightness – perceived as log of luminance (how bright we see luminance) To compensate for this , apply a tone reproduction curve (TRC) to the input data & then use a linear dither mask. 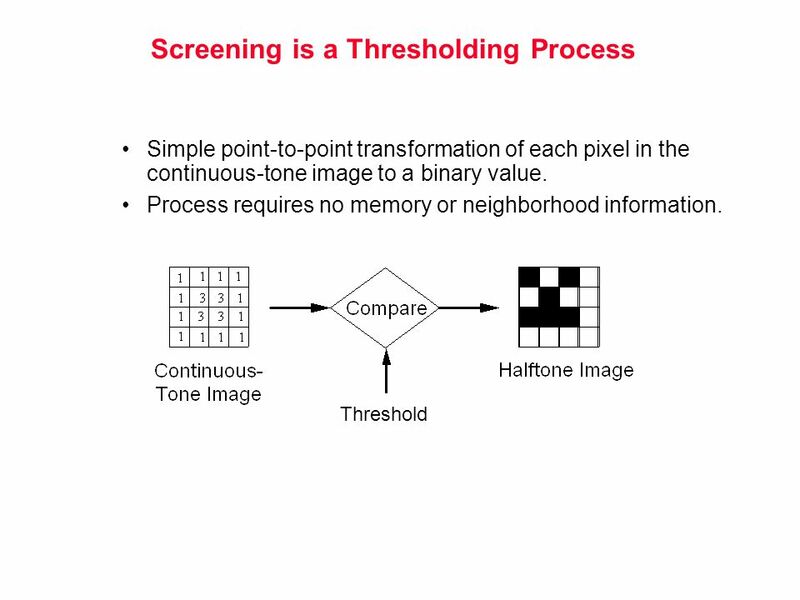 threshold. 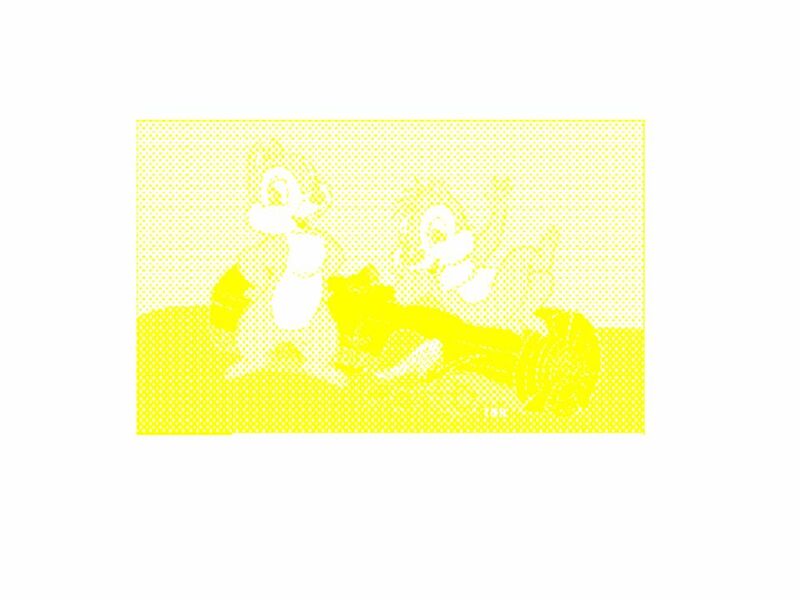 The result of dithering with a white noise threshold. 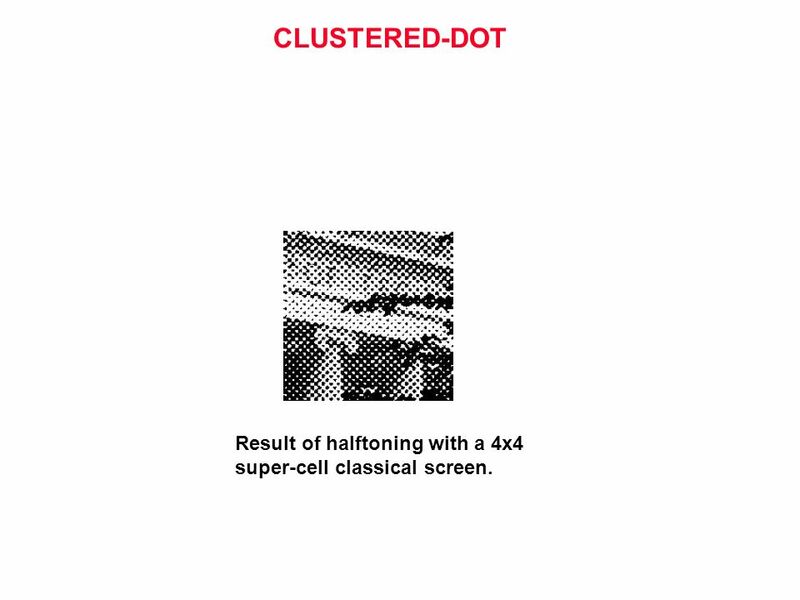 13 CLUSTERED-DOT Result of halftoning with a 4x4 super-cell classical screen. 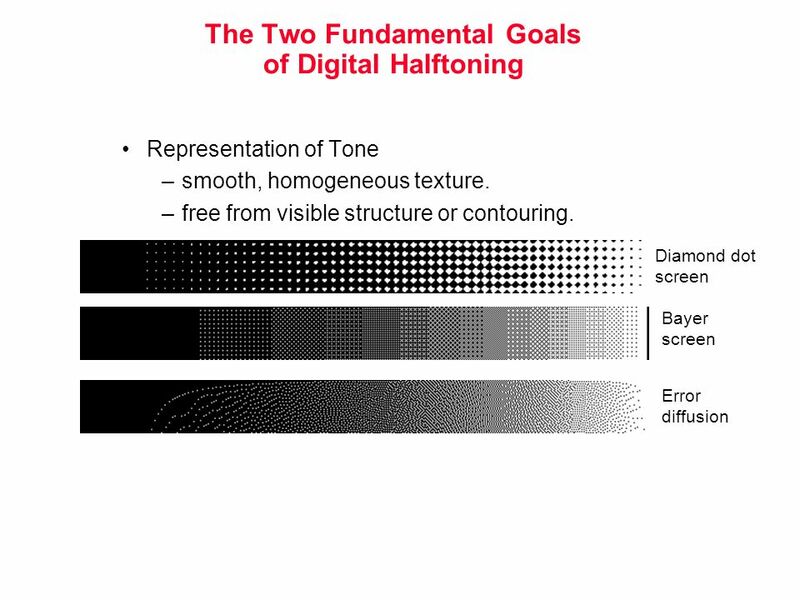 24 What is digital halftoning? 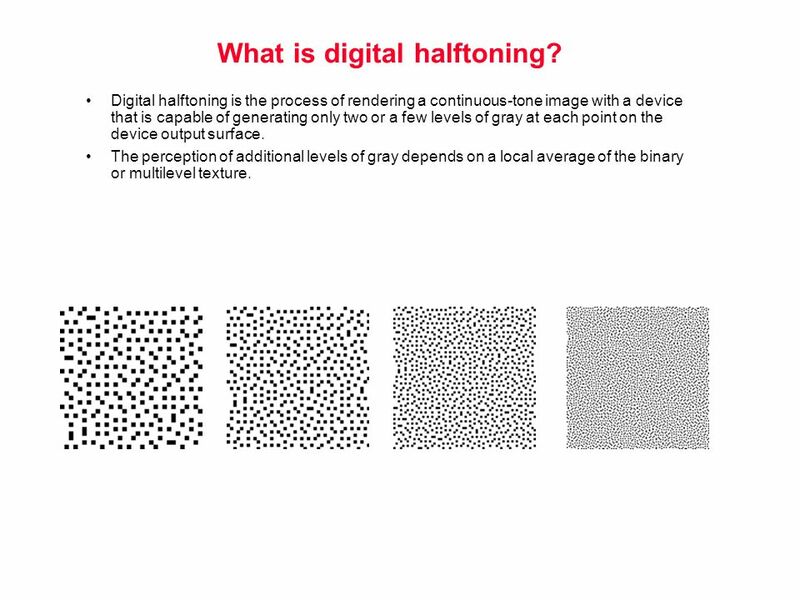 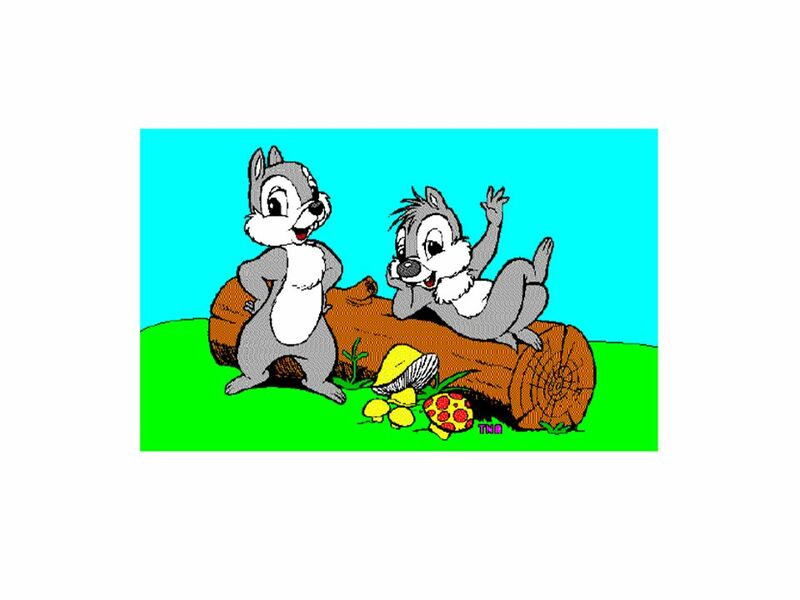 Digital halftoning is the process of rendering a continuous-tone image with a device that is capable of generating only two or a few levels of gray at each point on the device output surface. 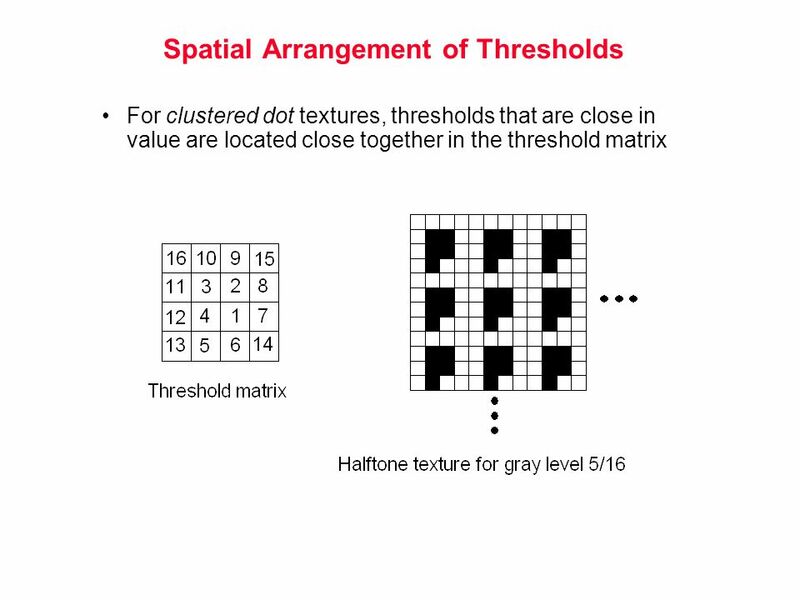 The perception of additional levels of gray depends on a local average of the binary or multilevel texture. 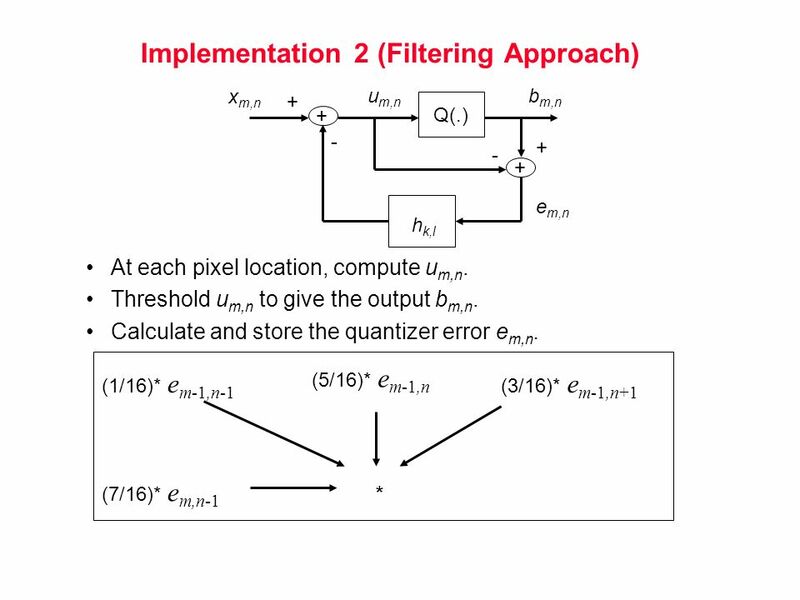 Amplitude modulation - dot size varies, dot spacing is fixed. 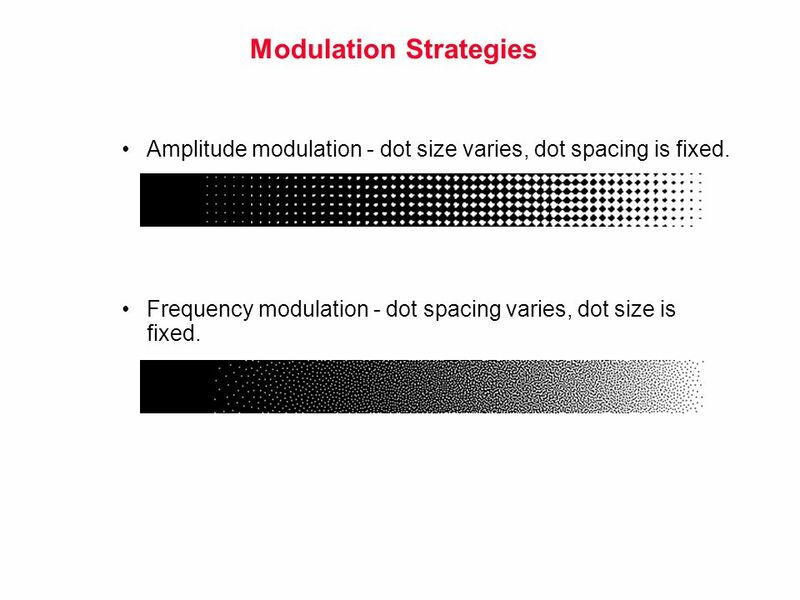 Frequency modulation - dot spacing varies, dot size is fixed. 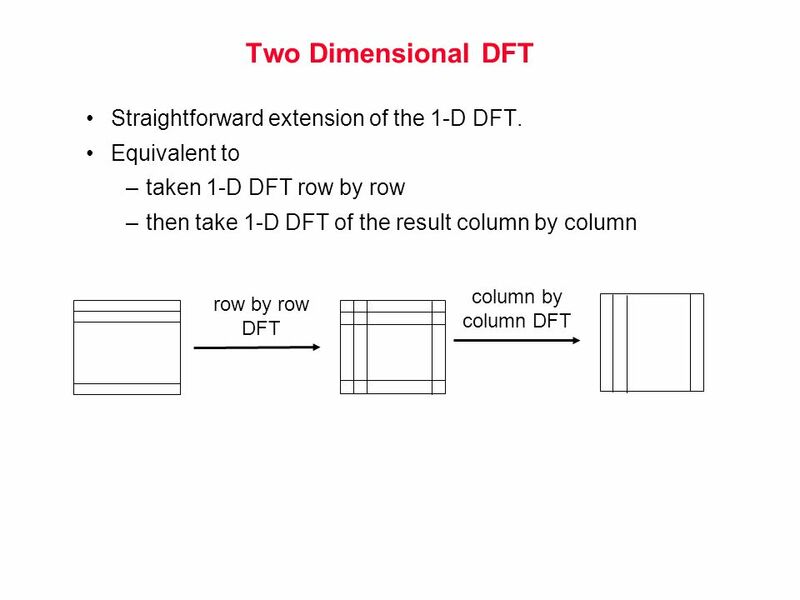 31 Two Dimensional DFT Straightforward extension of the 1-D DFT. 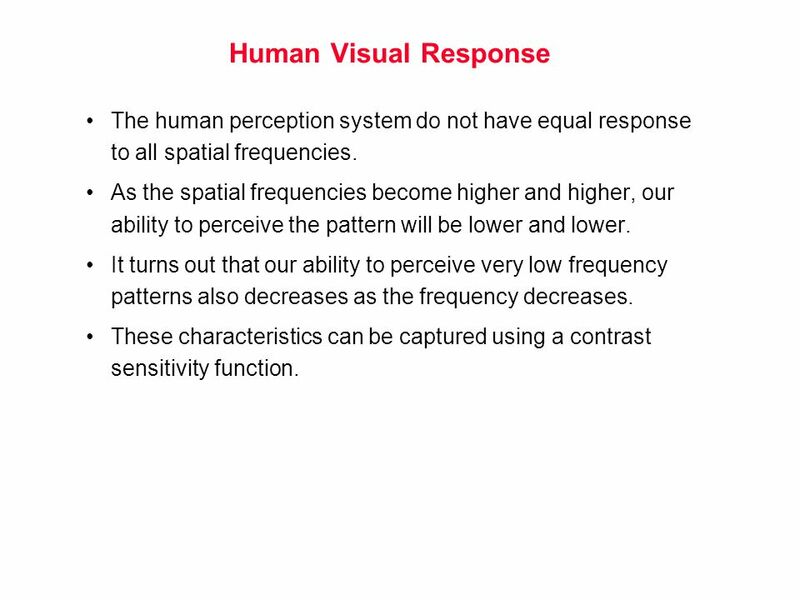 32 Human Visual Response The human perception system do not have equal response to all spatial frequencies. 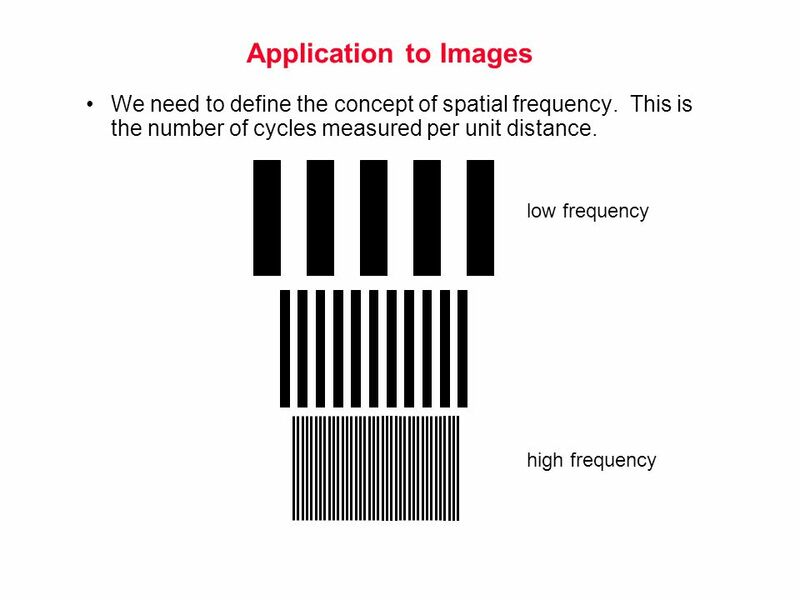 As the spatial frequencies become higher and higher, our ability to perceive the pattern will be lower and lower. 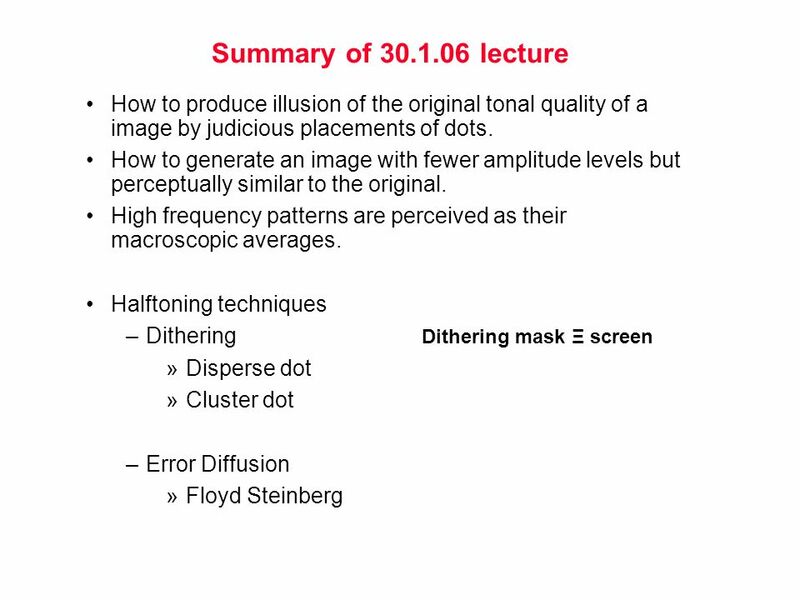 It turns out that our ability to perceive very low frequency patterns also decreases as the frequency decreases. 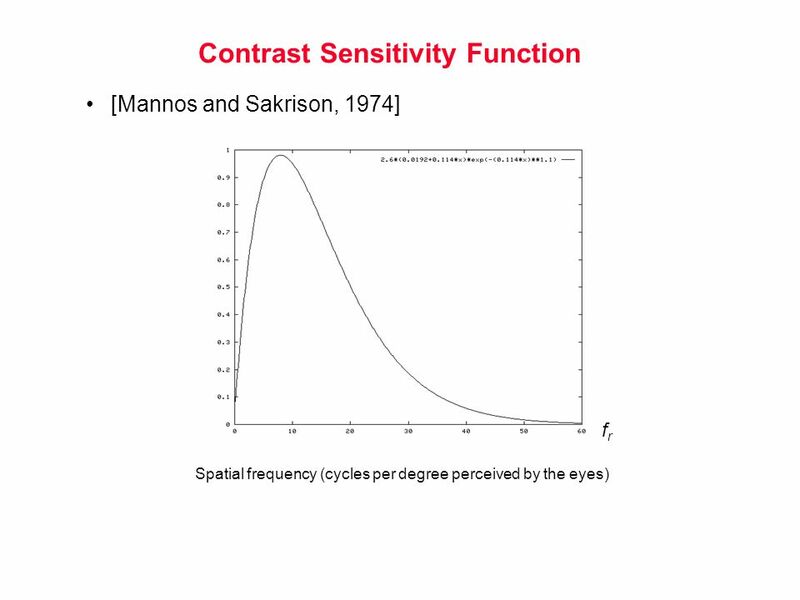 These characteristics can be captured using a contrast sensitivity function. 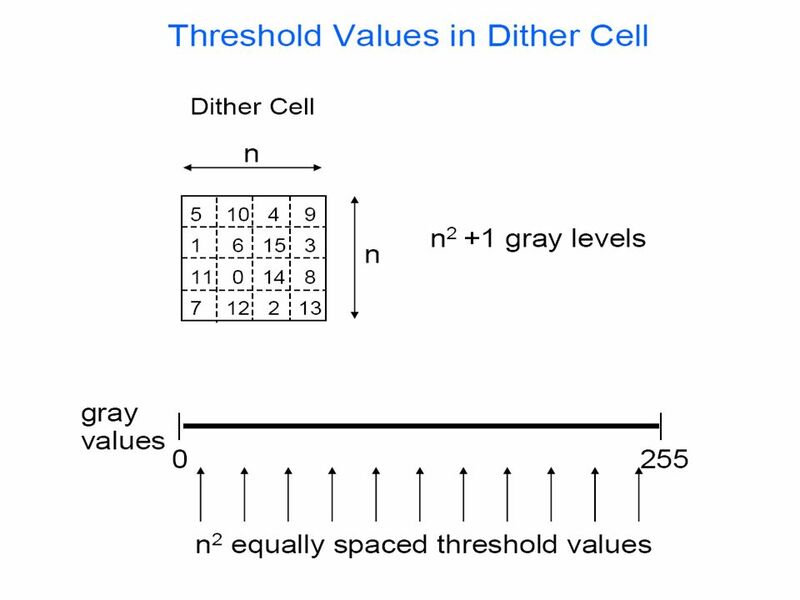 36 Why Not Use a Single Threshold? 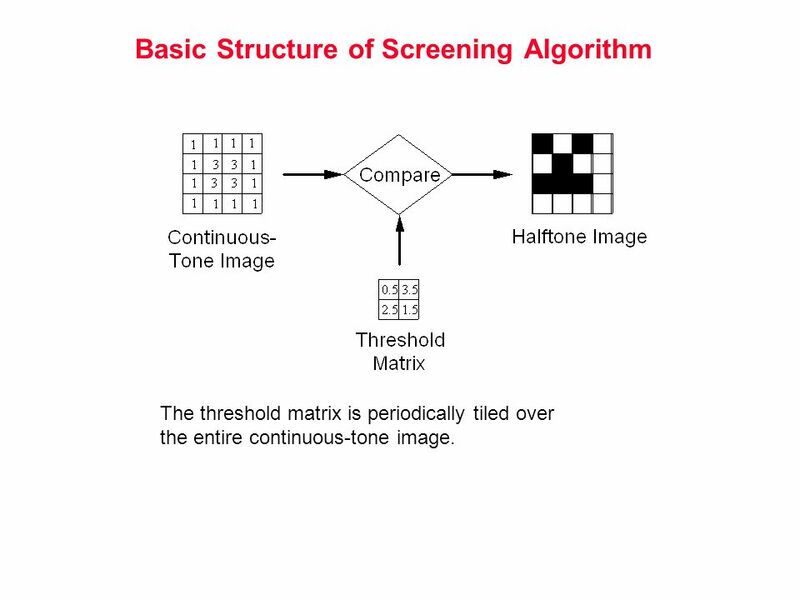 The threshold matrix is periodically tiled over the entire continuous-tone image. 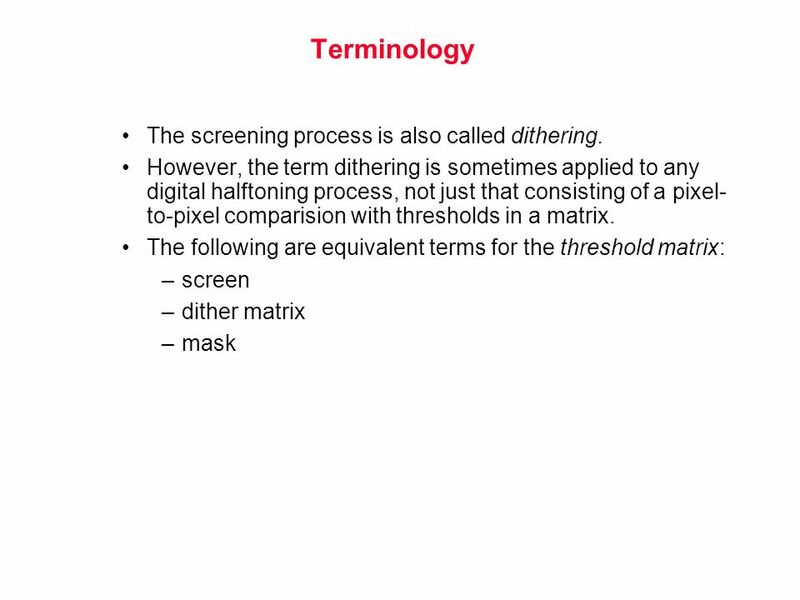 38 Terminology The screening process is also called dithering. 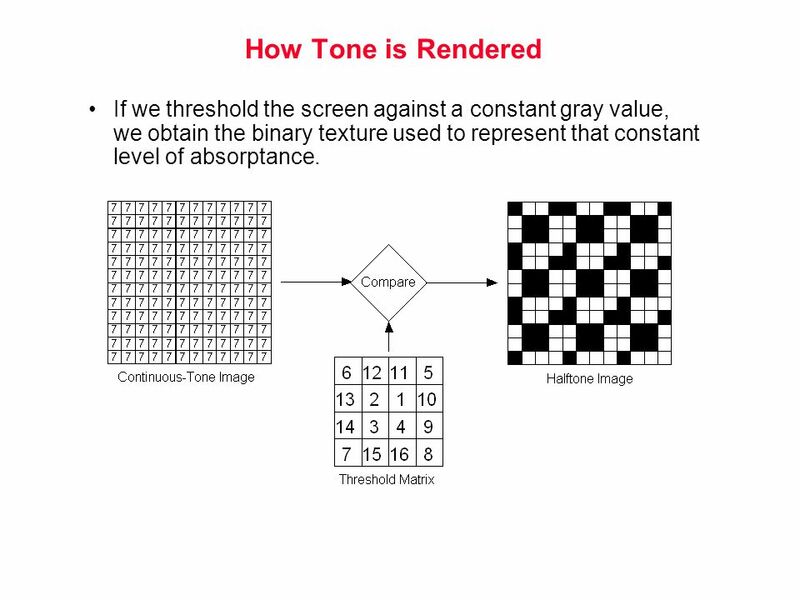 39 How Tone is Rendered If we threshold the screen against a constant gray value, we obtain the binary texture used to represent that constant level of absorptance. 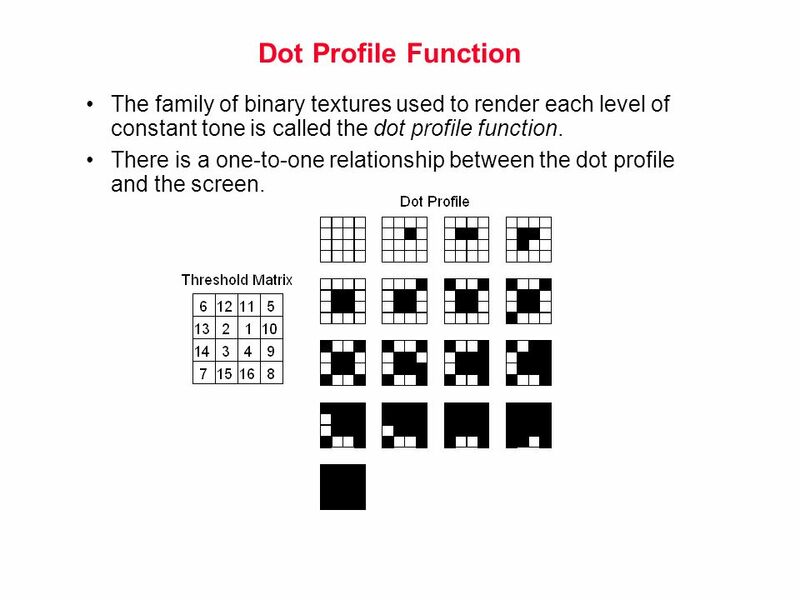 40 Dot Profile Function The family of binary textures used to render each level of constant tone is called the dot profile function. 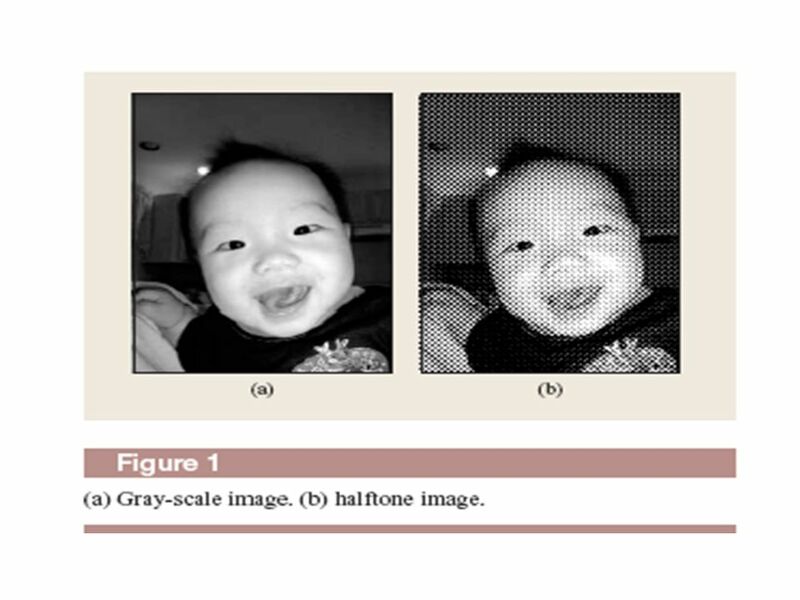 There is a one-to-one relationship between the dot profile and the screen. 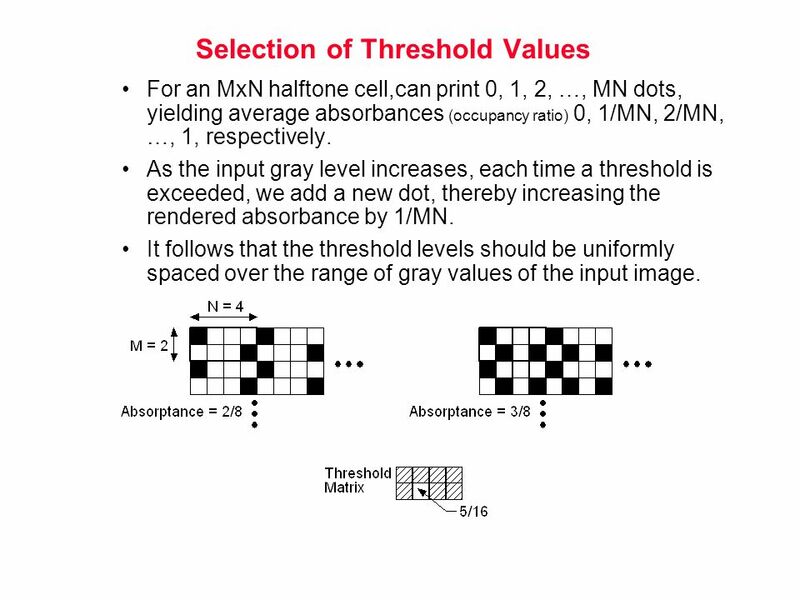 For an MxN halftone cell,can print 0, 1, 2, …, MN dots, yielding average absorbances (occupancy ratio) 0, 1/MN, 2/MN, …, 1, respectively. 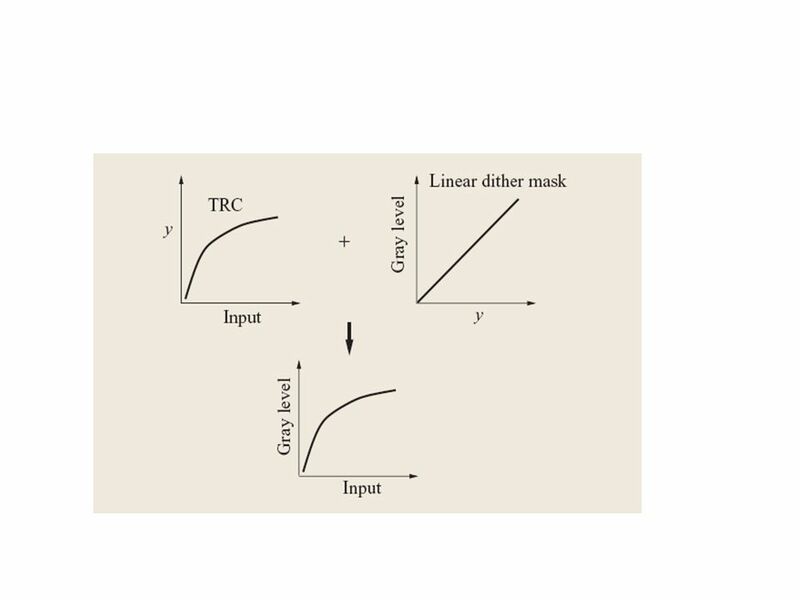 As the input gray level increases, each time a threshold is exceeded, we add a new dot, thereby increasing the rendered absorbance by 1/MN. 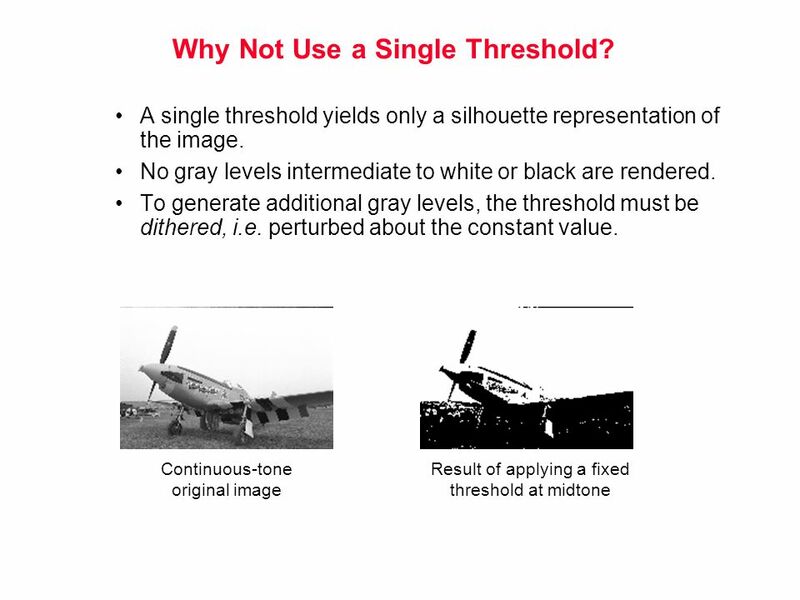 It follows that the threshold levels should be uniformly spaced over the range of gray values of the input image. 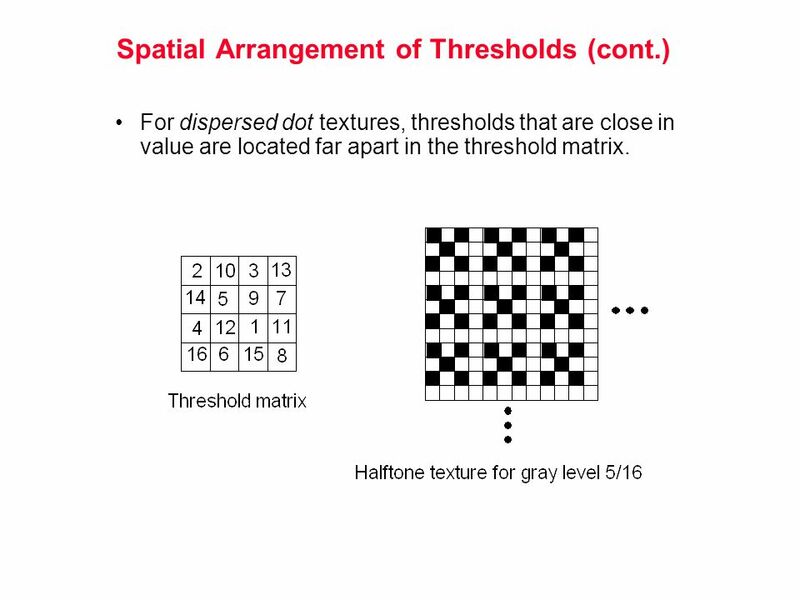 For dispersed dot textures, thresholds that are close in value are located far apart in the threshold matrix. 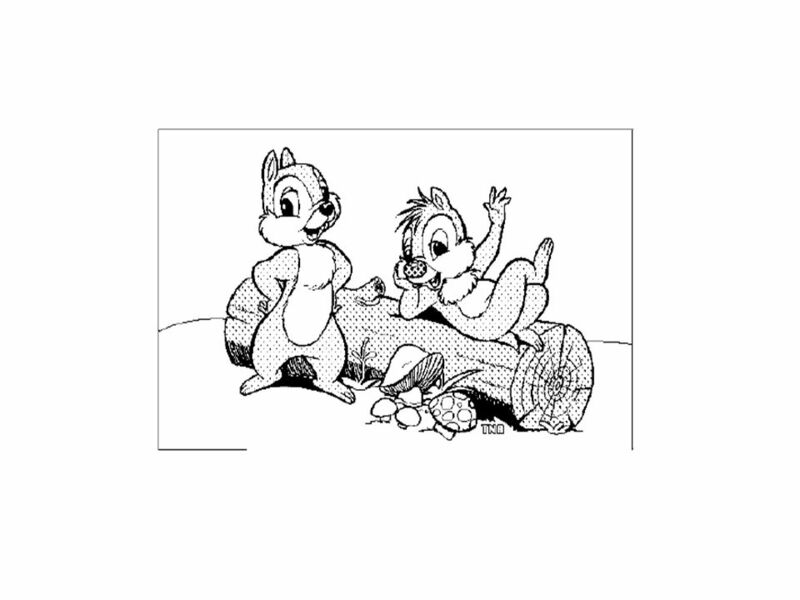 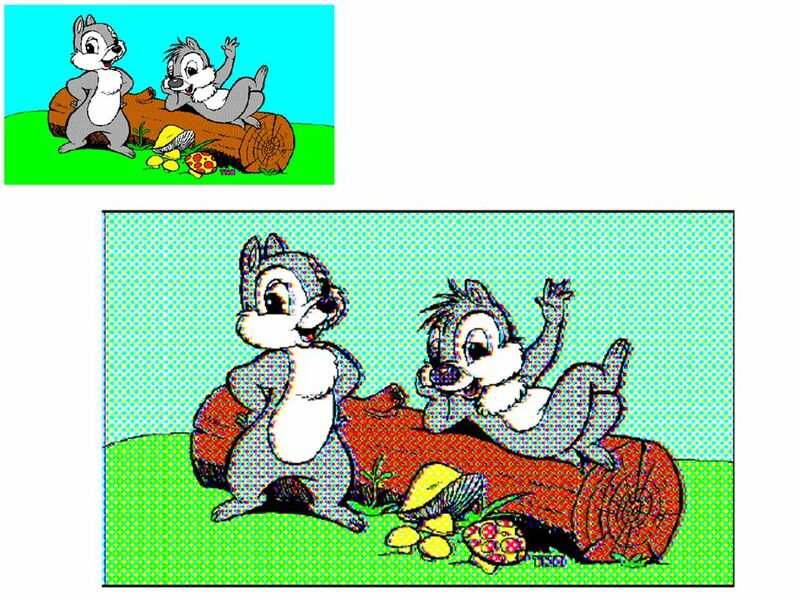 Compute the halftone image in the example given below to show how detail is rendered with a dispersed dot screen. 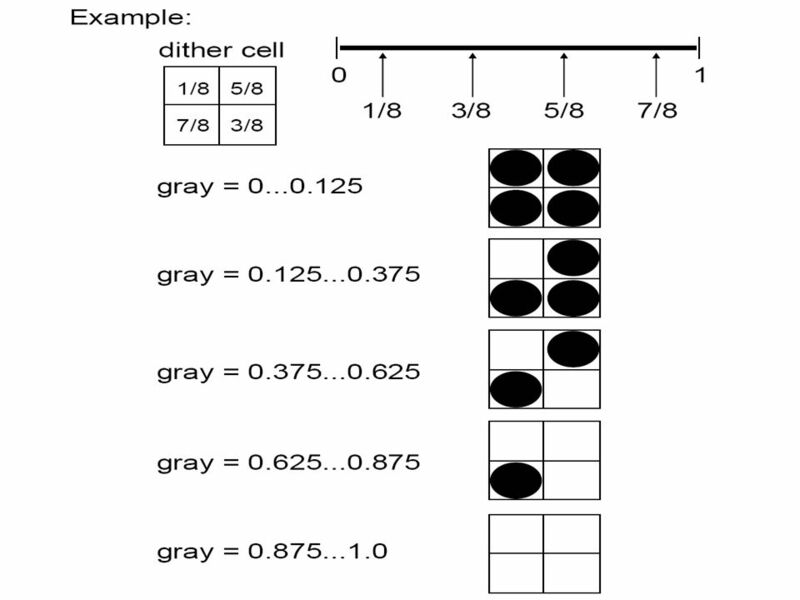 Note that these assessments are relative. 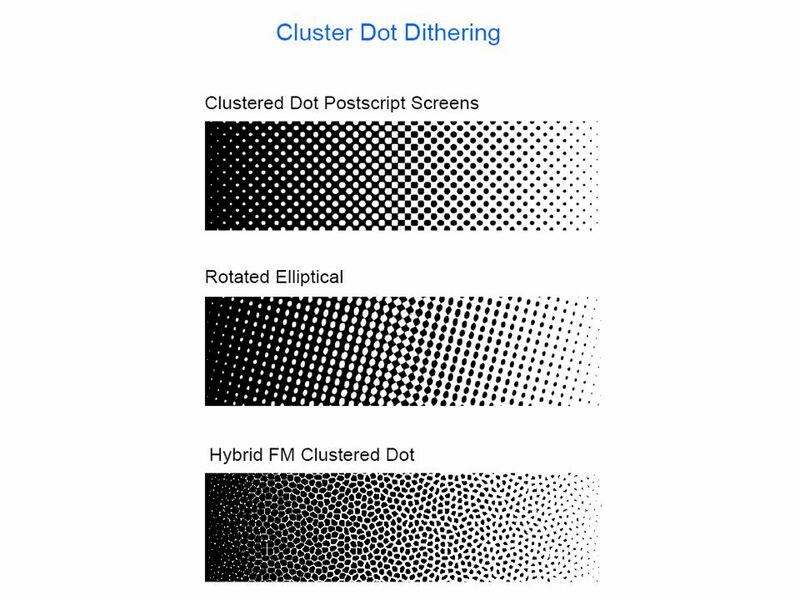 For example, at sufficiently high resolution, clustered dot textures will also have low visibility and good detail rendition. 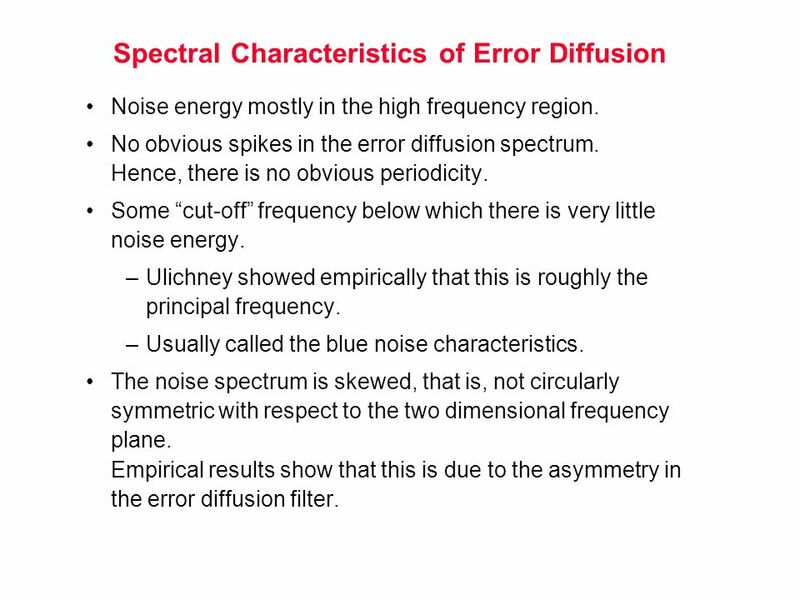 Noise energy mostly in the high frequency region. 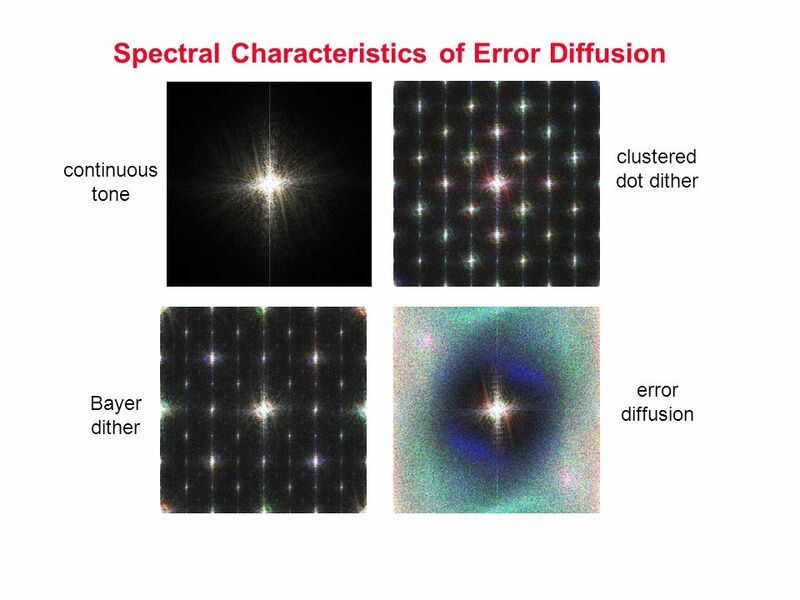 No obvious spikes in the error diffusion spectrum. 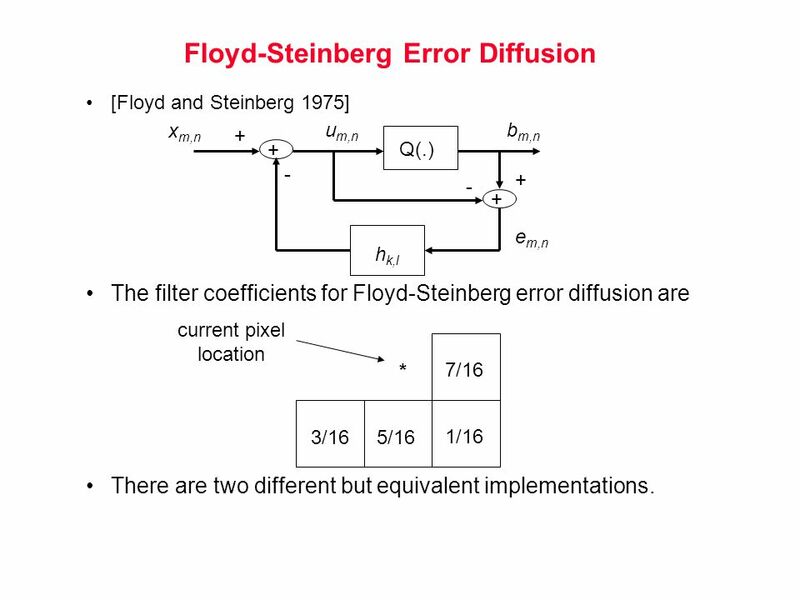 Hence, there is no obvious periodicity. 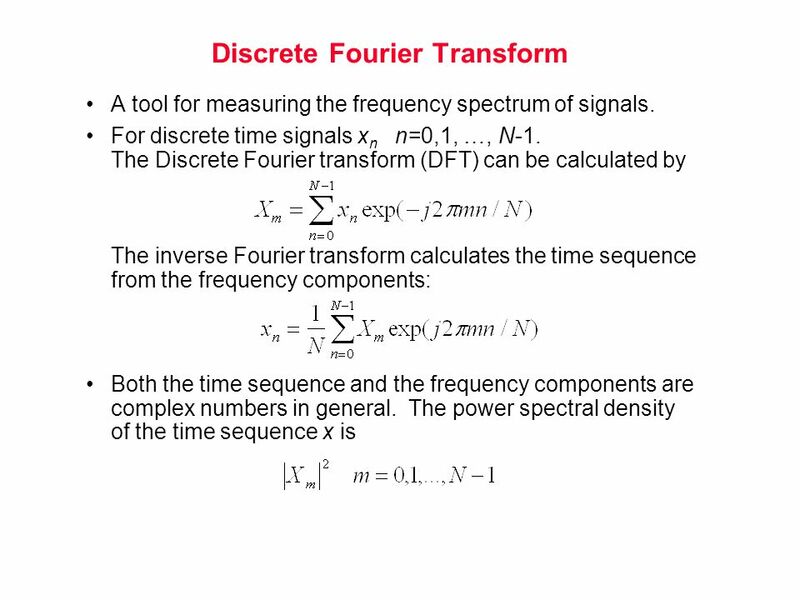 Some “cut-off” frequency below which there is very little noise energy. 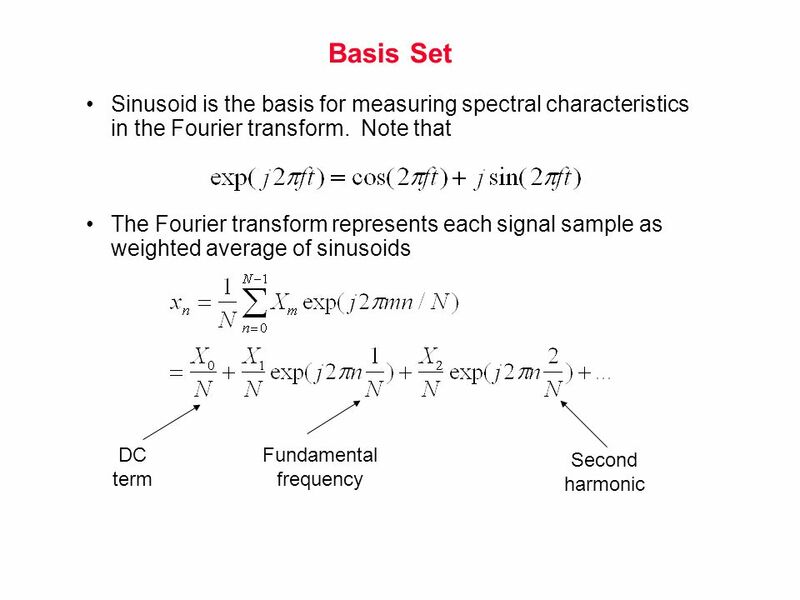 Ulichney showed empirically that this is roughly the principal frequency. 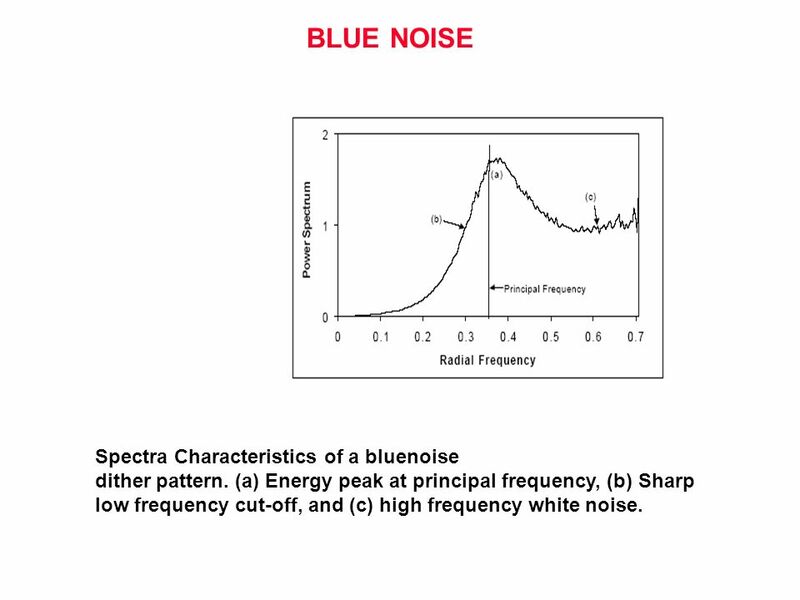 Usually called the blue noise characteristics. 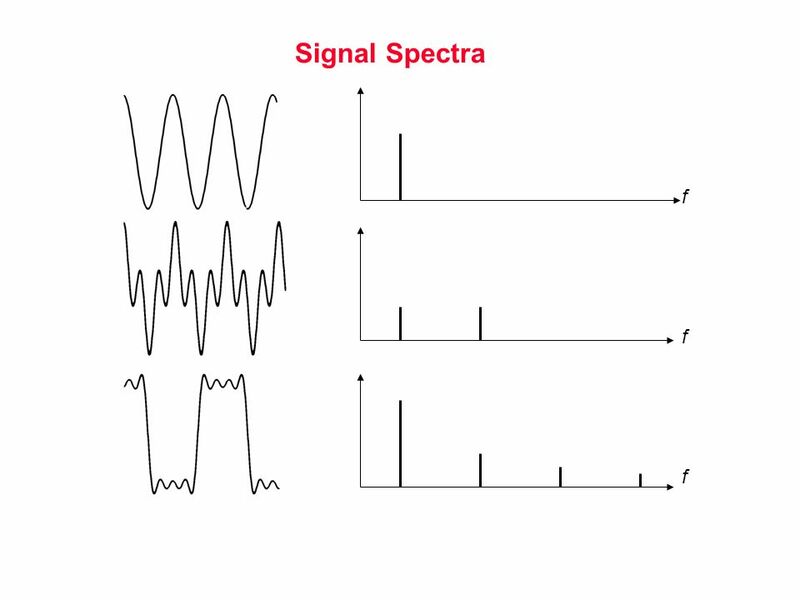 The noise spectrum is skewed, that is, not circularly symmetric with respect to the two dimensional frequency plane. 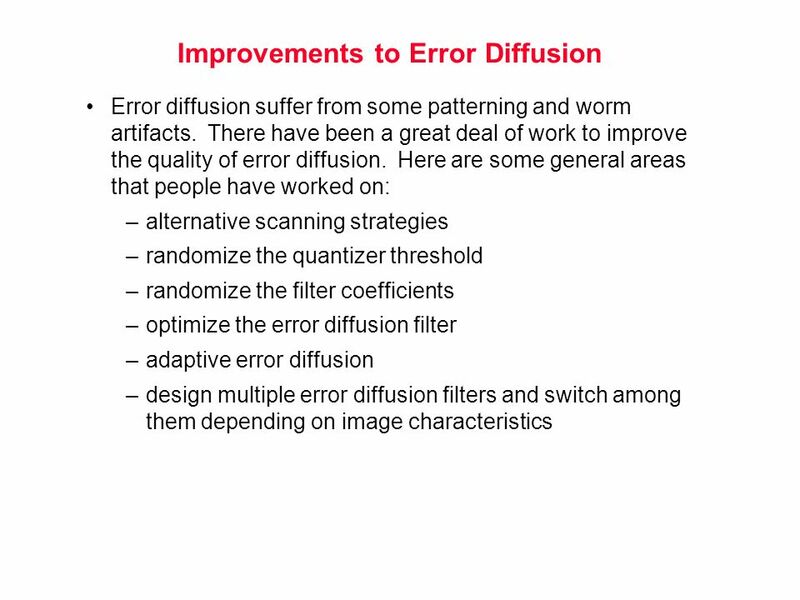 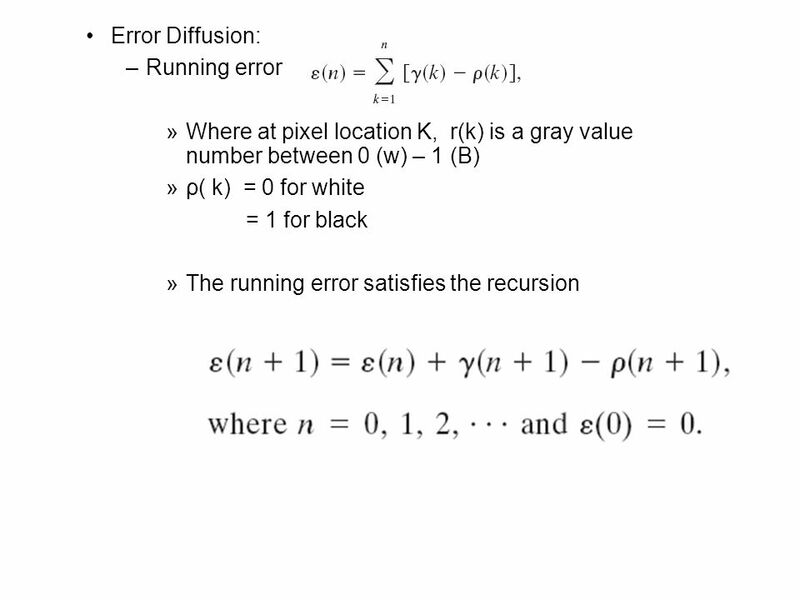 Empirical results show that this is due to the asymmetry in the error diffusion filter. 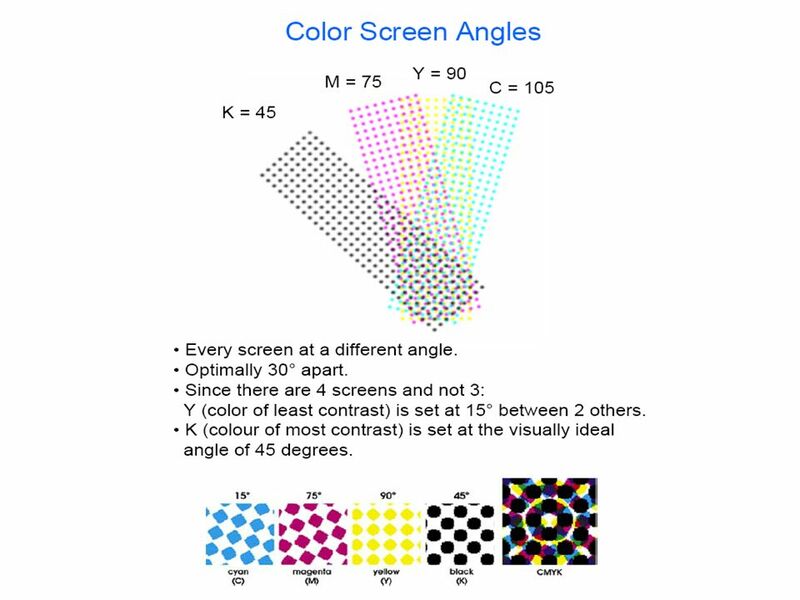 Conversion from RGB to CMYK. 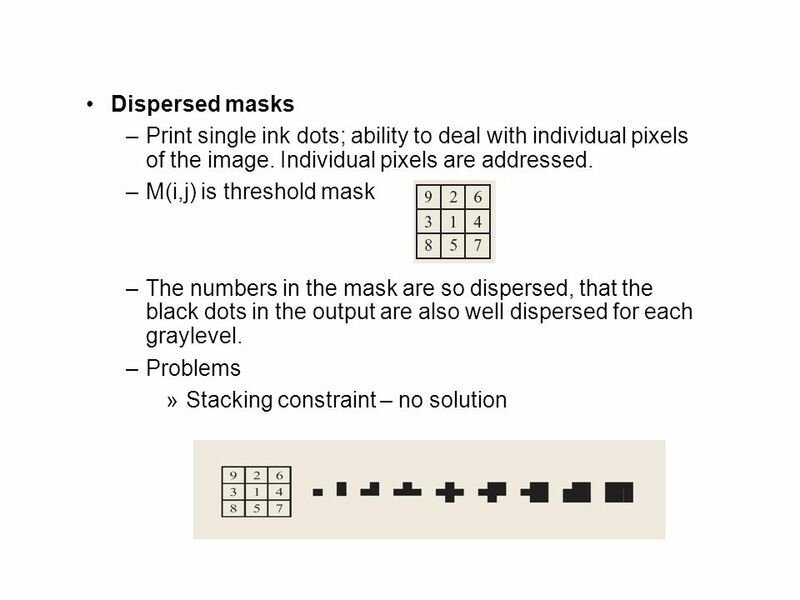 Determination of what dots to print and where for a given CMYK amount. 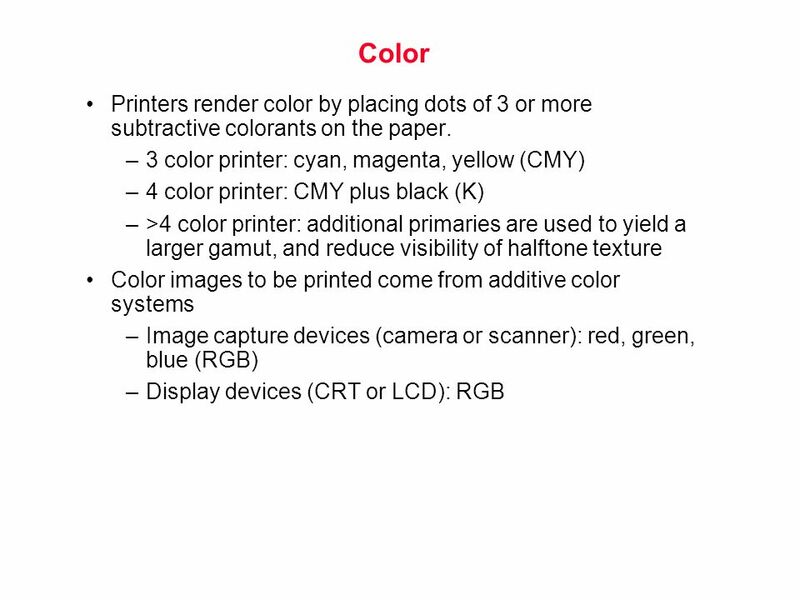 The color as expressed in a device-independent color space, such as CIE L*a*b*, that results for a given CMYK amount depends on both print mechanism and colorants, halftoning algorithm. 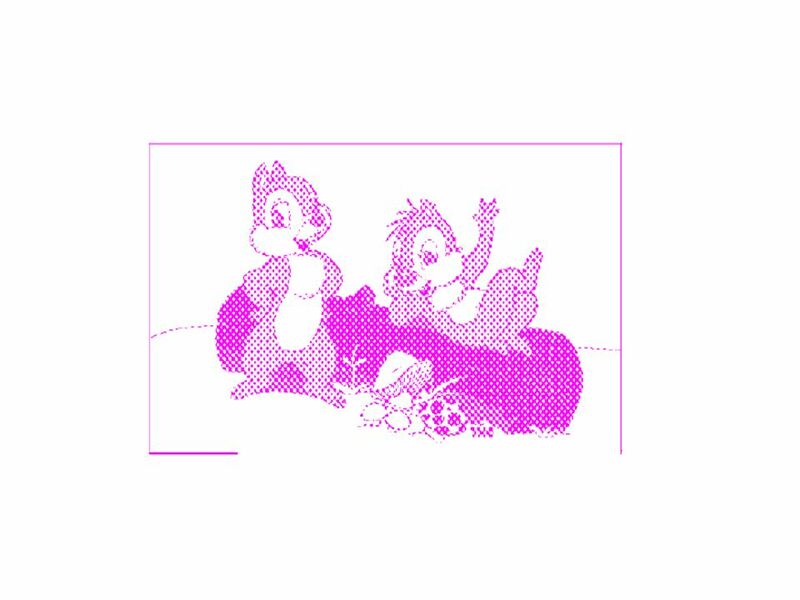 Ideally, the halftoning algorithm and RGB to CMYK conversion should be designed together. 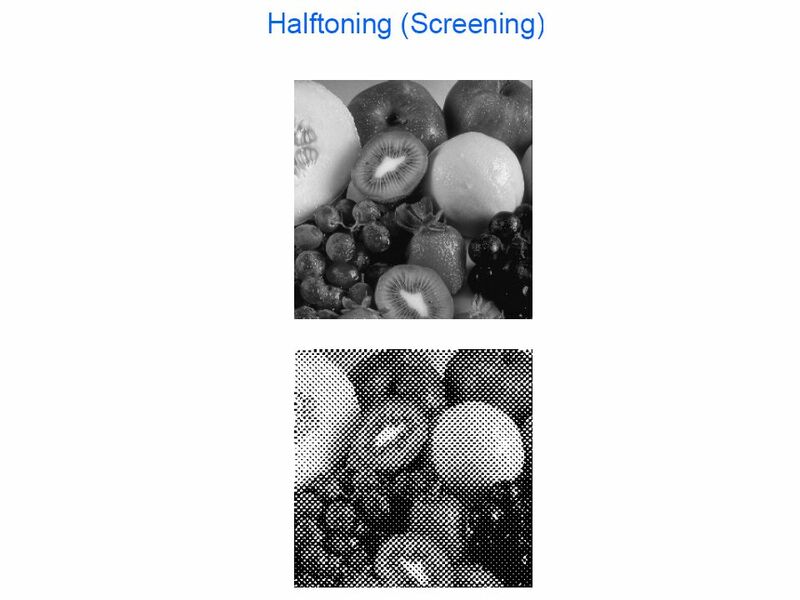 In practice, halftoning algorithm is developed first to render a given amount of CMYK. 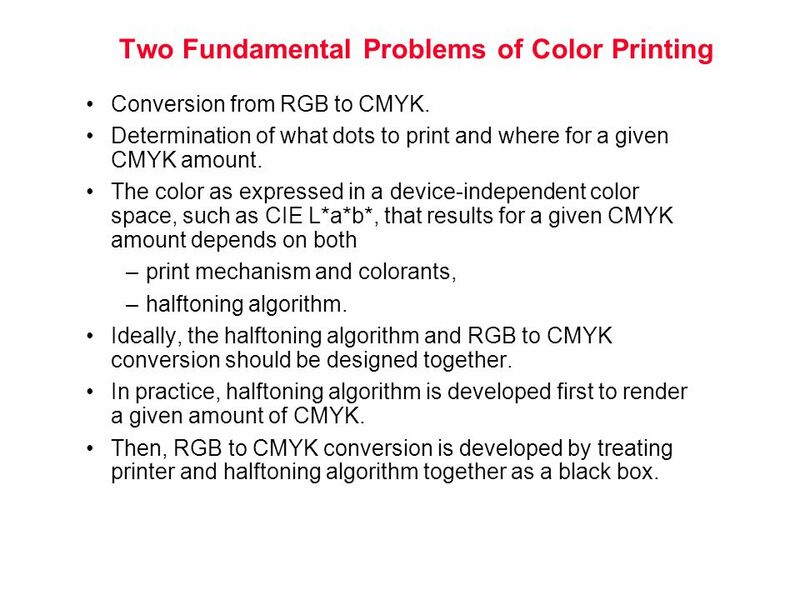 Then, RGB to CMYK conversion is developed by treating printer and halftoning algorithm together as a black box. 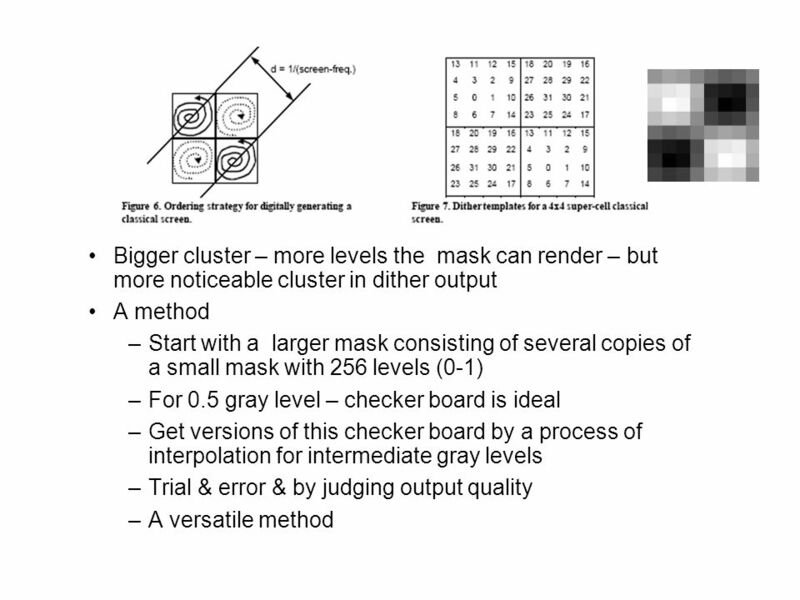 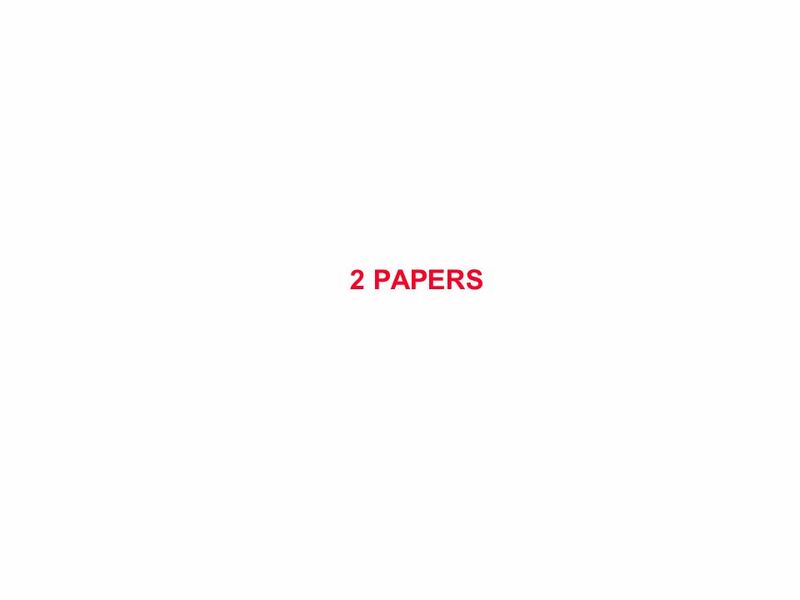 These algorithms emulate well-established techniques developed for conventional offset and lithographic printing. 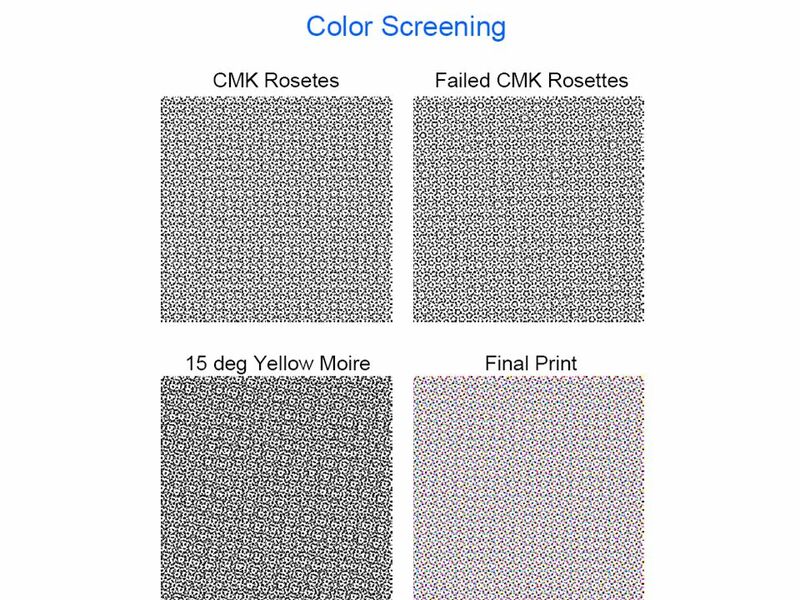 The screens are rotated relative to each other to minimize formation of rosettes: darkest two colors (M and K) are separated by 45 degrees, next lighter color (C) is separated from these two by 22 degrees, lightest color (Y) is not rotated. 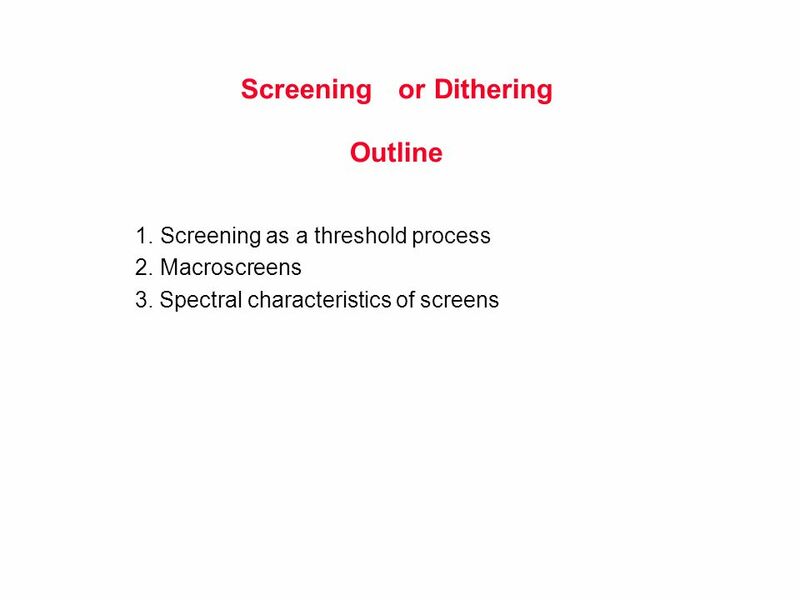 The finite addressability of the printer necessitates careful design of the screens which is usually done by hand. 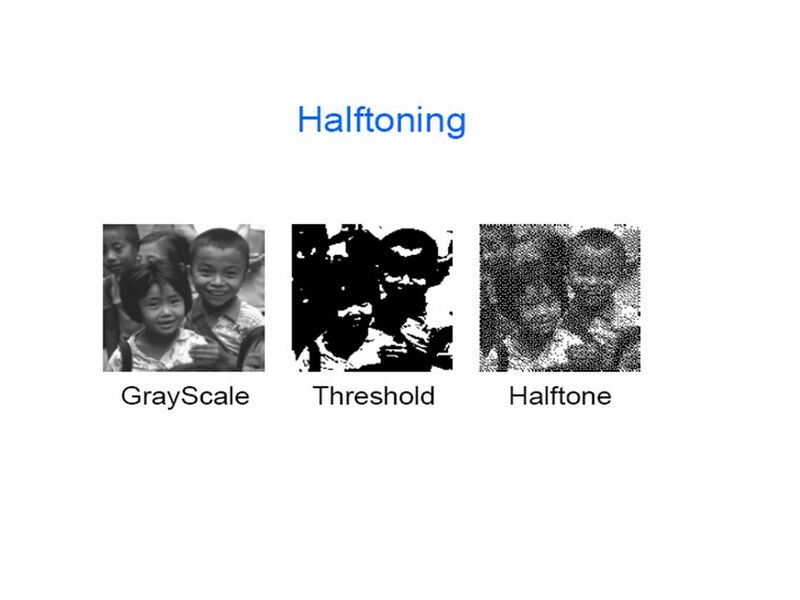 CMYK halftones can each be generated independently. 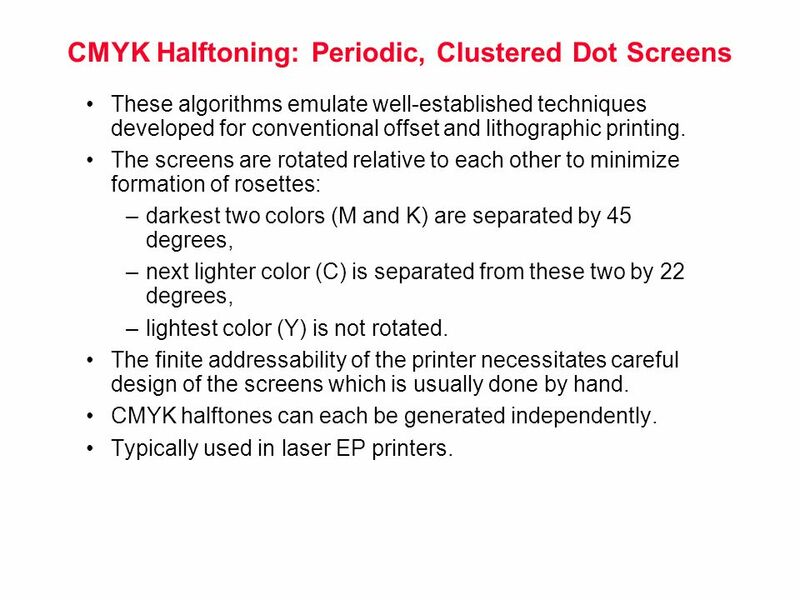 Typically used in laser EP printers. 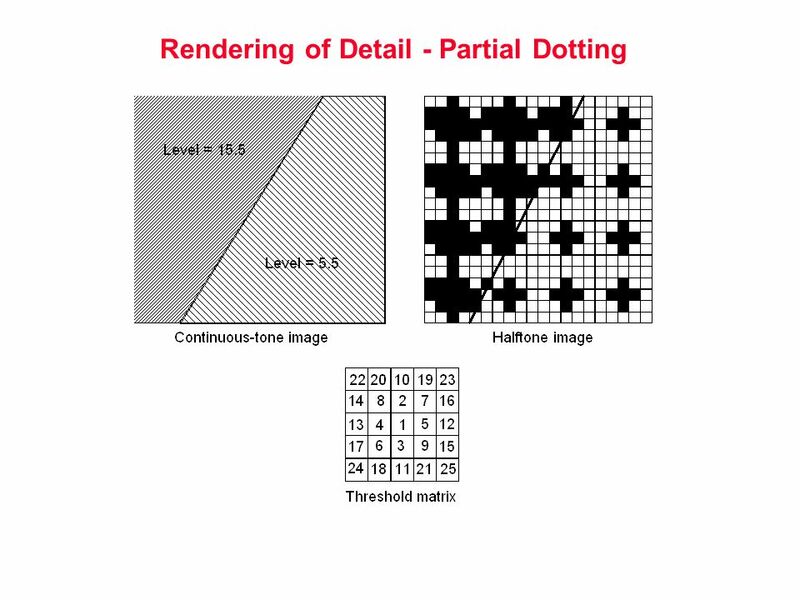 Since the halftone textures have no periodic structure, rosettes cannot occur. 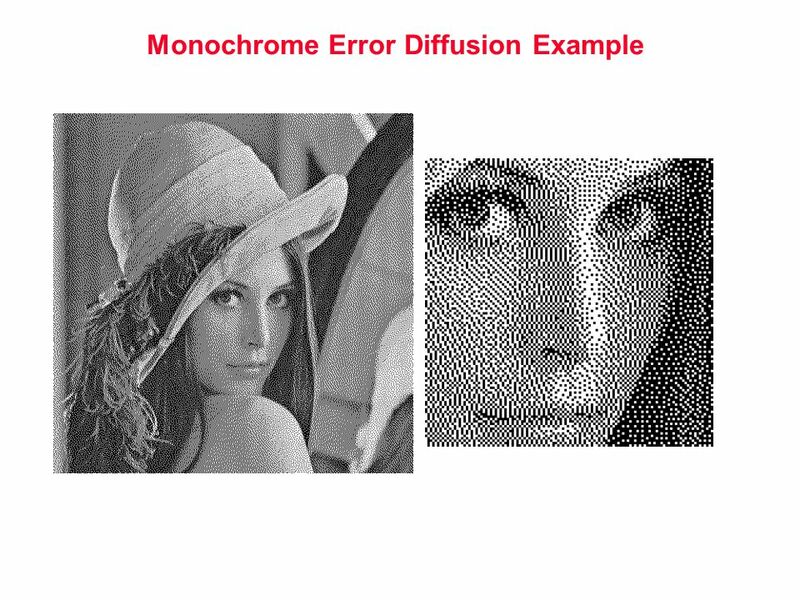 However, interference between colorant planes is still possible, and results in graininess or mottle. 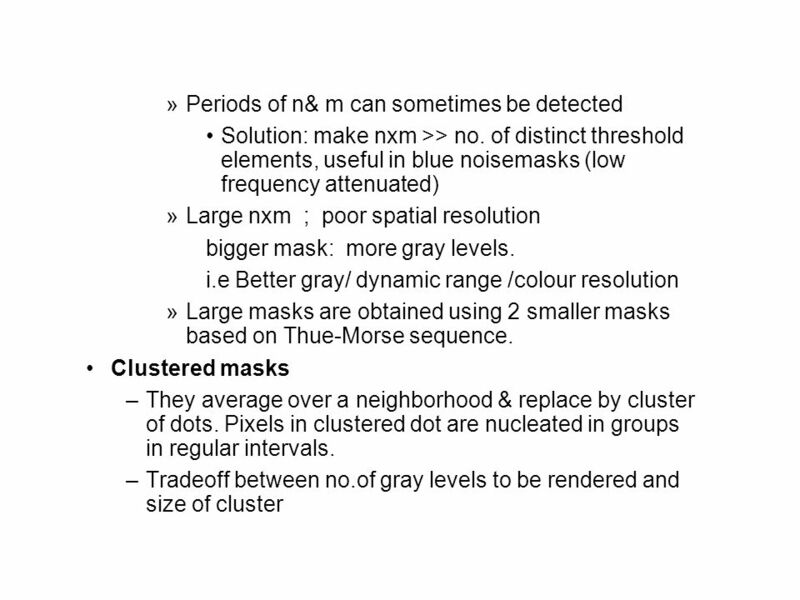 Can use either: blue noise mask, error diffusion. 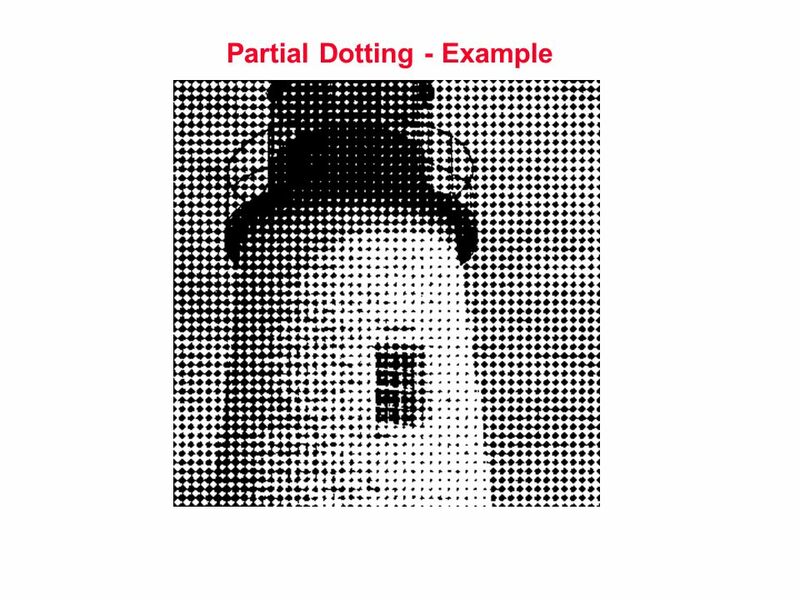 Halftone patterns can either be dot-on-dot or dot-off-dot. 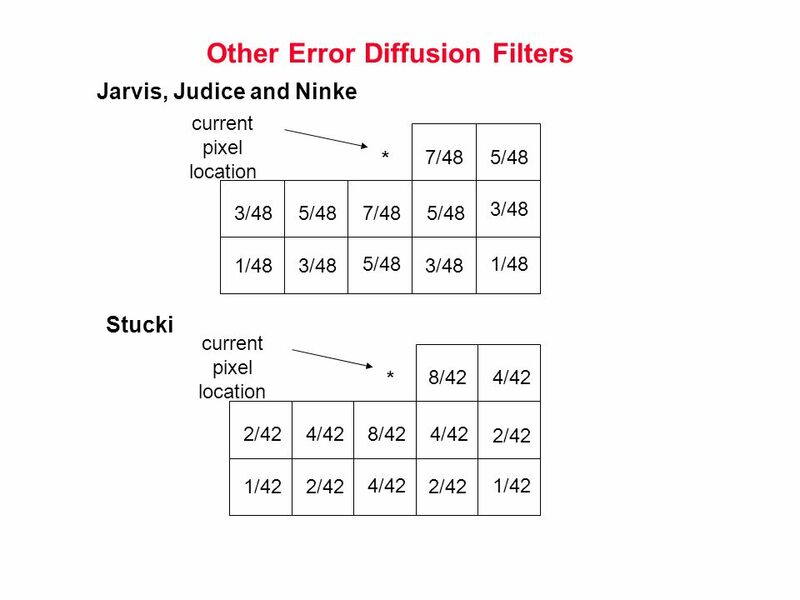 Typically used in IJ printers. 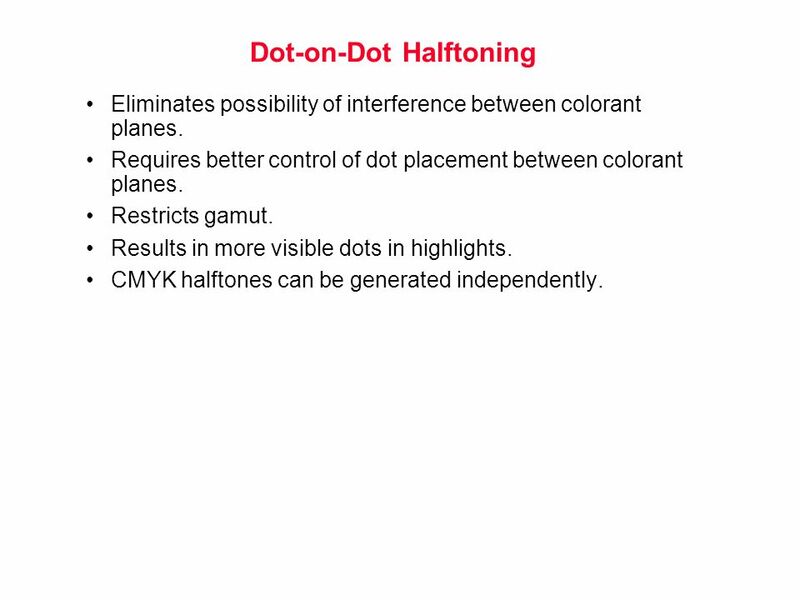 Eliminates possibility of interference between colorant planes. 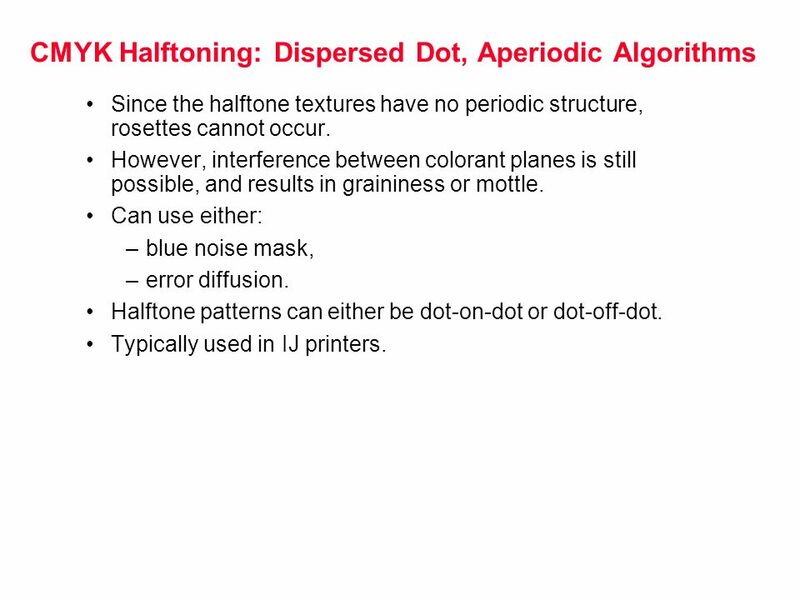 Requires better control of dot placement between colorant planes. 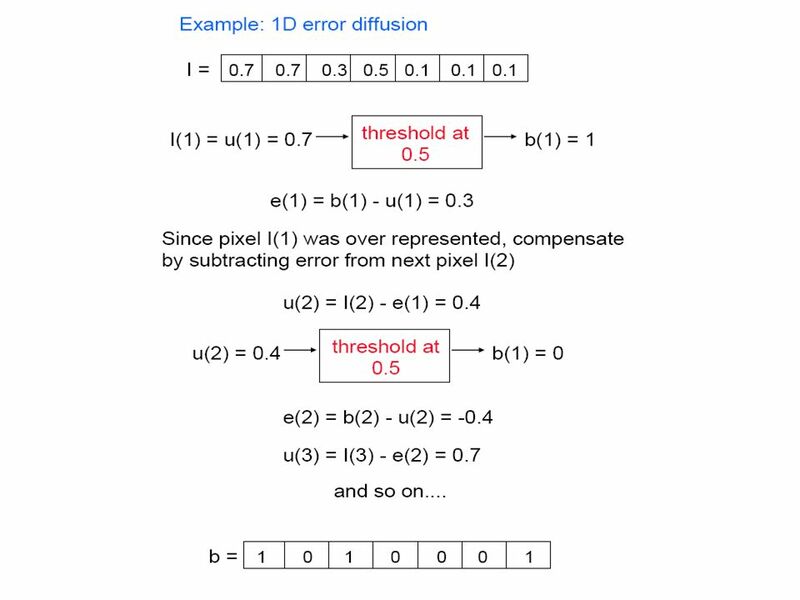 Restricts gamut. 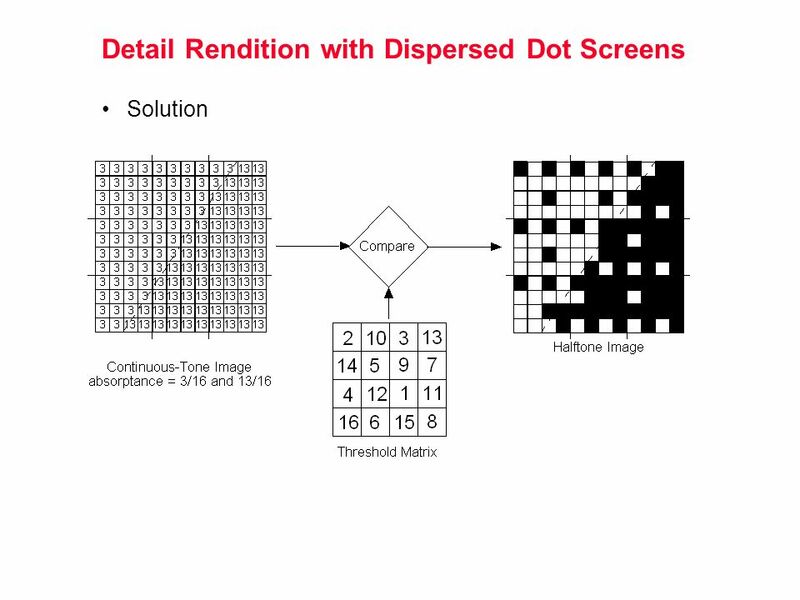 Results in more visible dots in highlights. 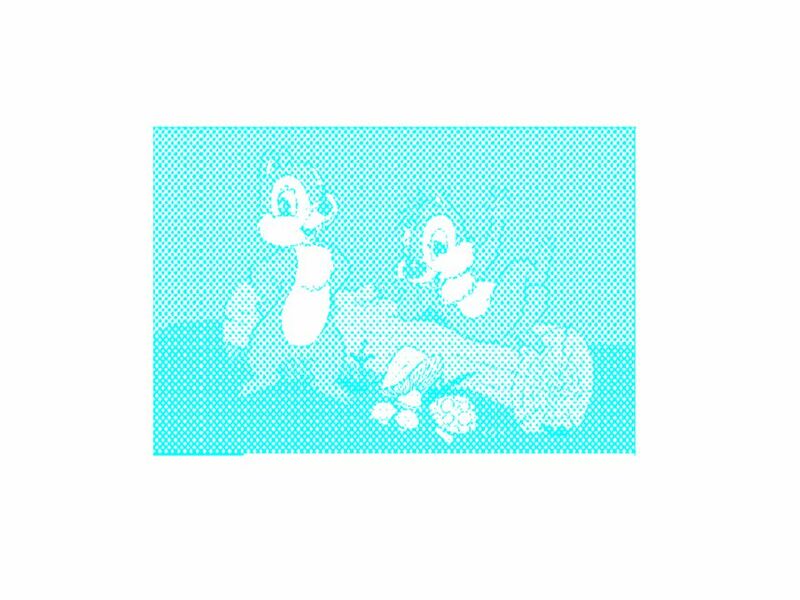 CMYK halftones can be generated independently. 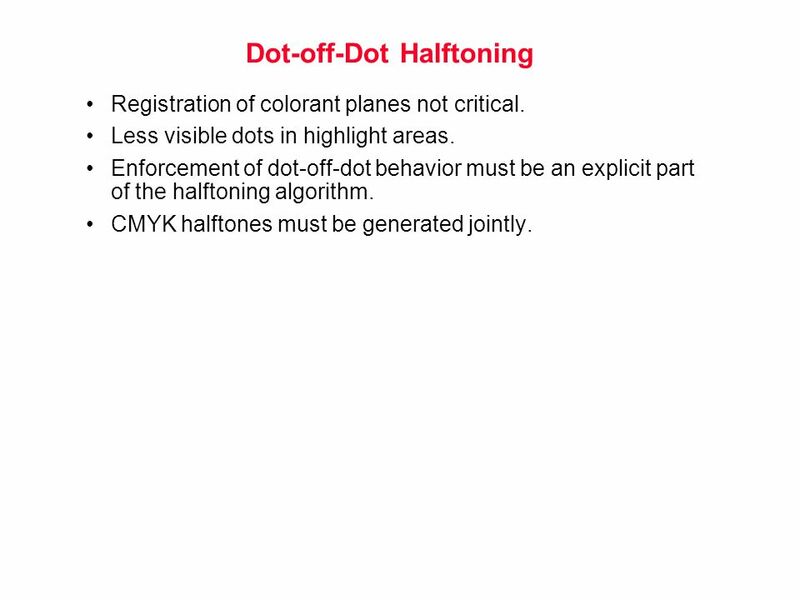 Registration of colorant planes not critical. 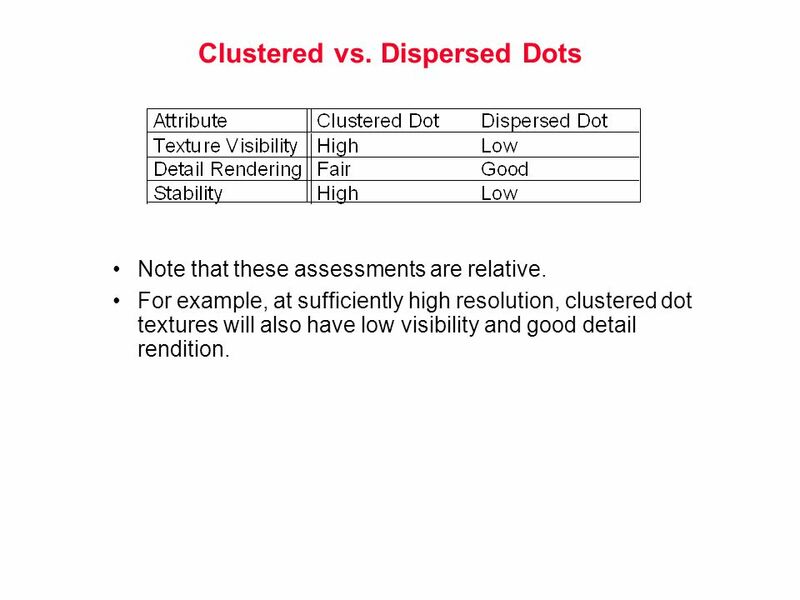 Less visible dots in highlight areas. 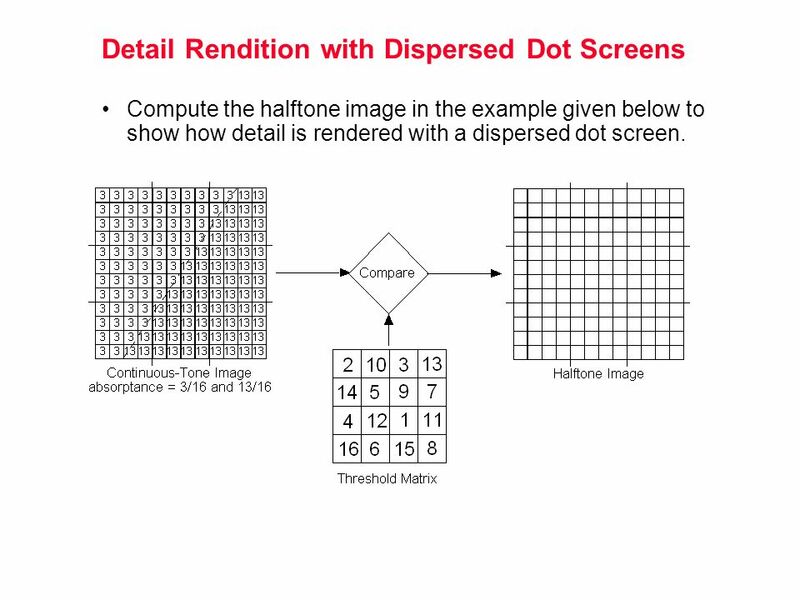 Enforcement of dot-off-dot behavior must be an explicit part of the halftoning algorithm. 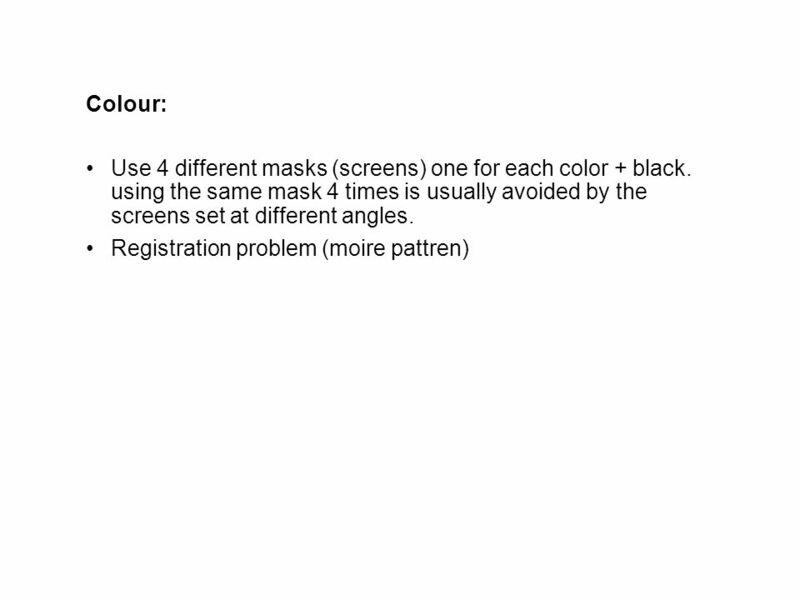 CMYK halftones must be generated jointly. 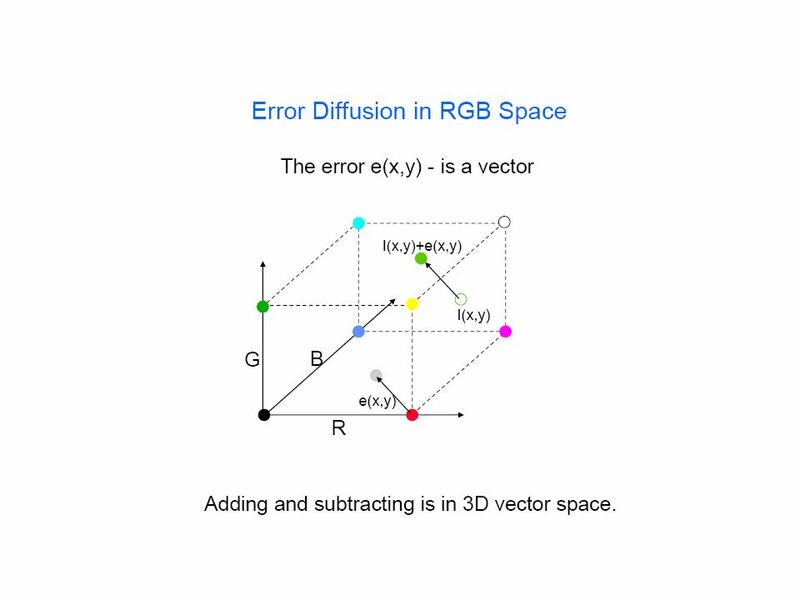 Convert input RGB image to a device-independent color space, such as CIE L*a*b*. 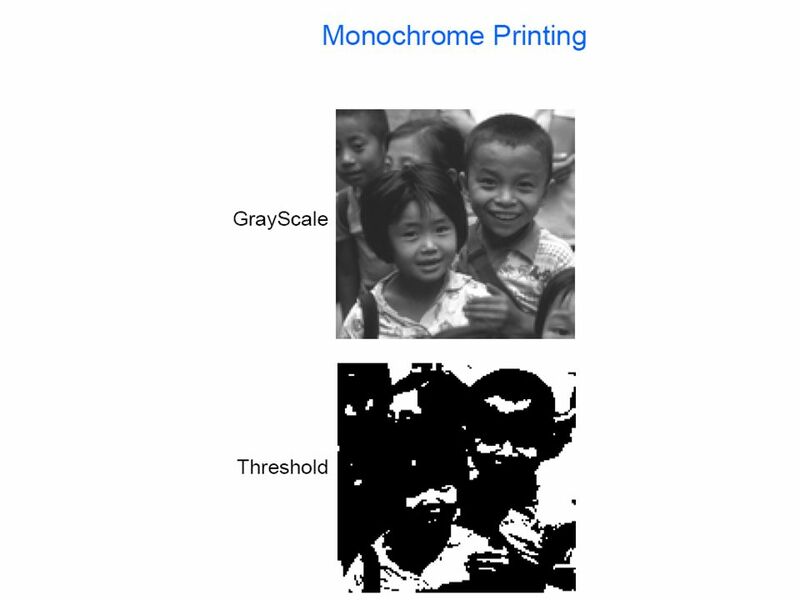 Characterize color printer/halftoning algorithm combination. 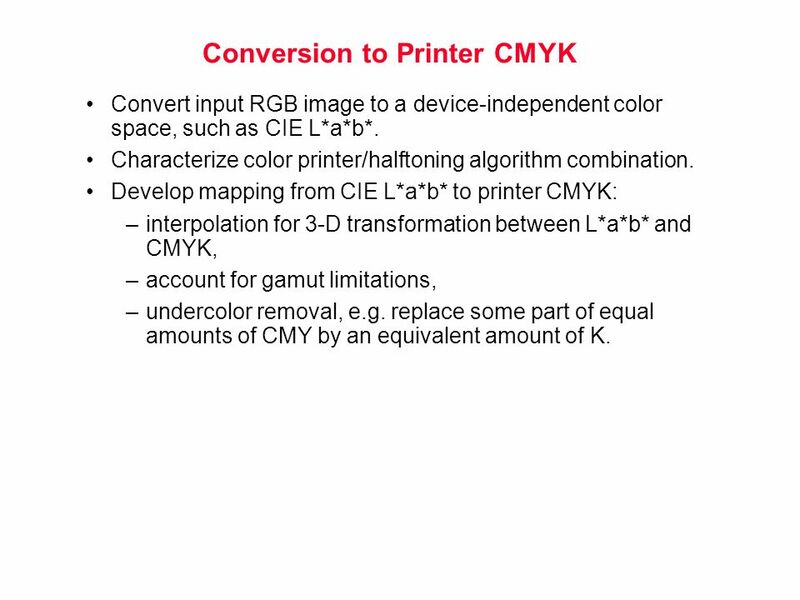 Develop mapping from CIE L*a*b* to printer CMYK: interpolation for 3-D transformation between L*a*b* and CMYK, account for gamut limitations, undercolor removal, e.g. 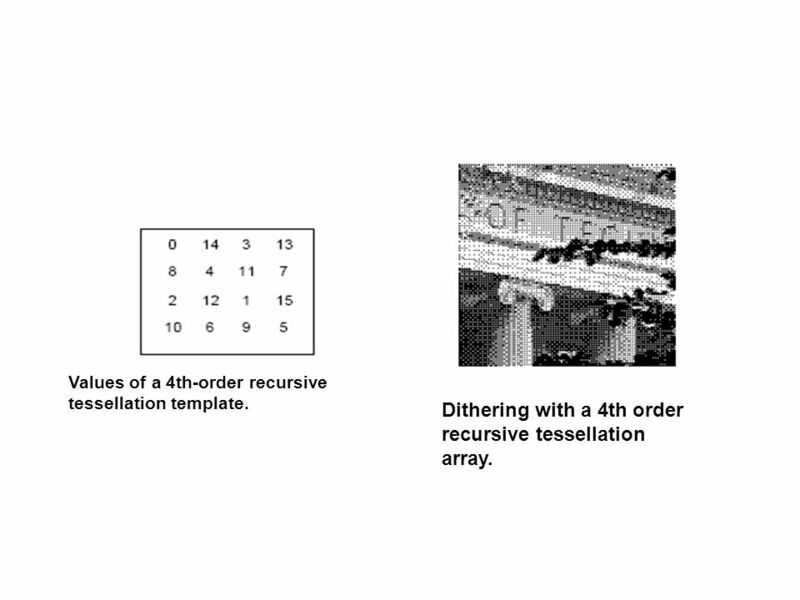 replace some part of equal amounts of CMY by an equivalent amount of K.
82 Dithering with a 4th order recursive tessellation array. 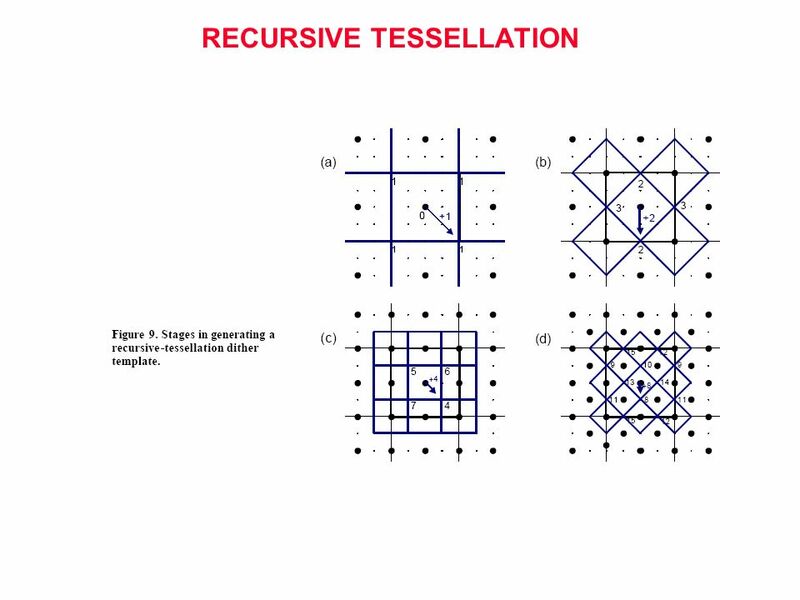 Values of a 4th-order recursive tessellation template. 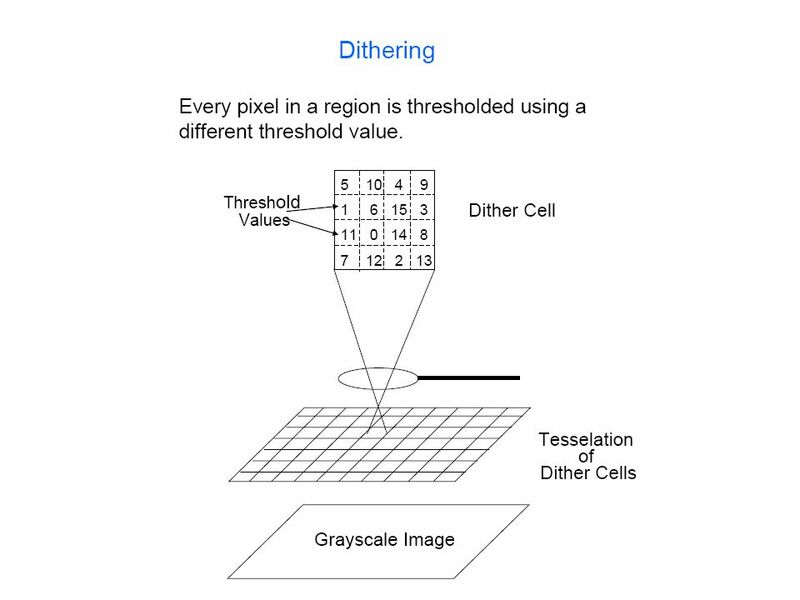 Dithering with a 4th order recursive tessellation array. 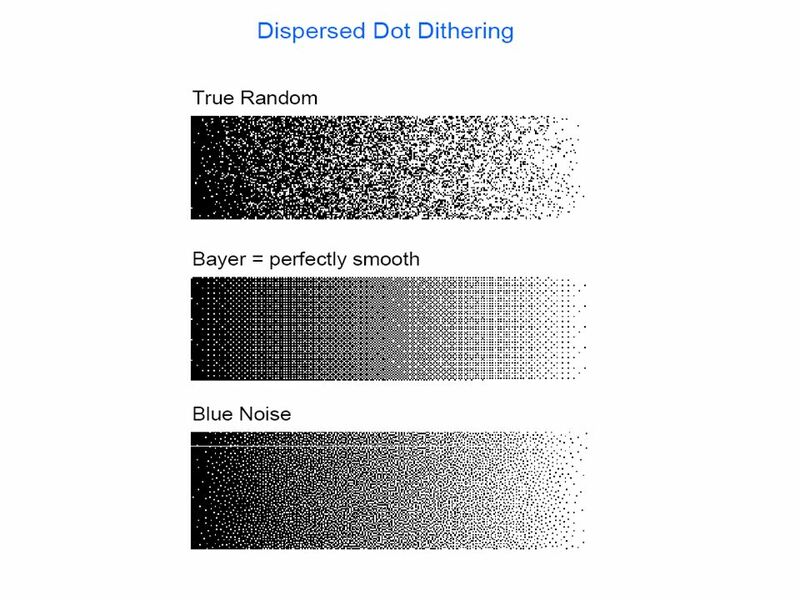 dither pattern. 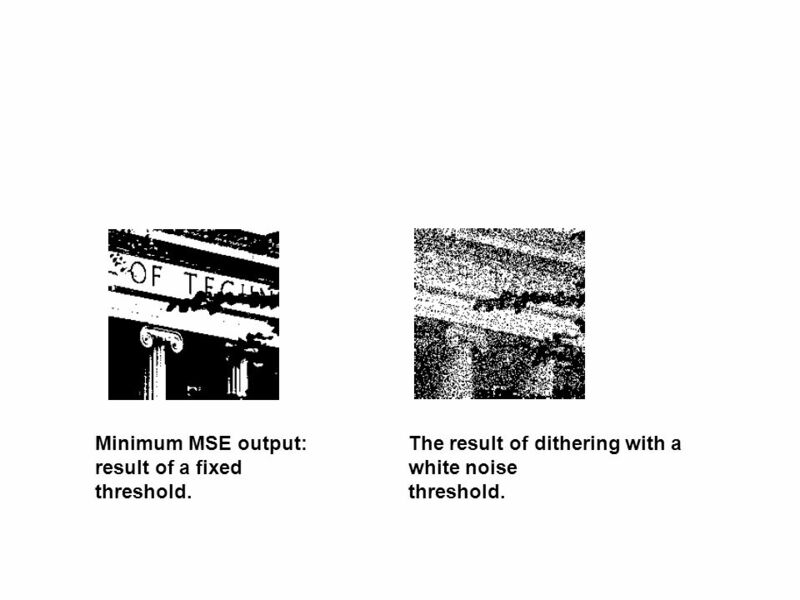 (a) Energy peak at principal frequency, (b) Sharp low frequency cut-off, and (c) high frequency white noise. 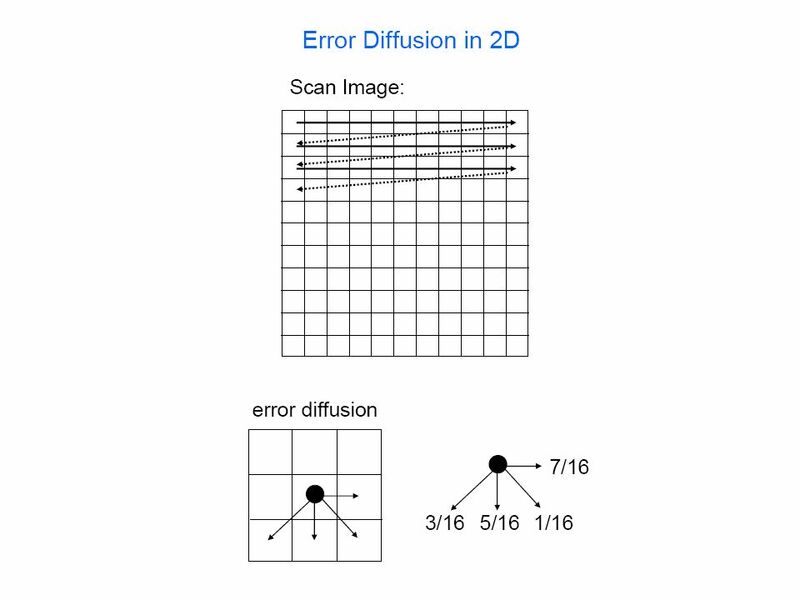  Image Characteristics  Image Digitization Spatial domain Intensity domain 1. 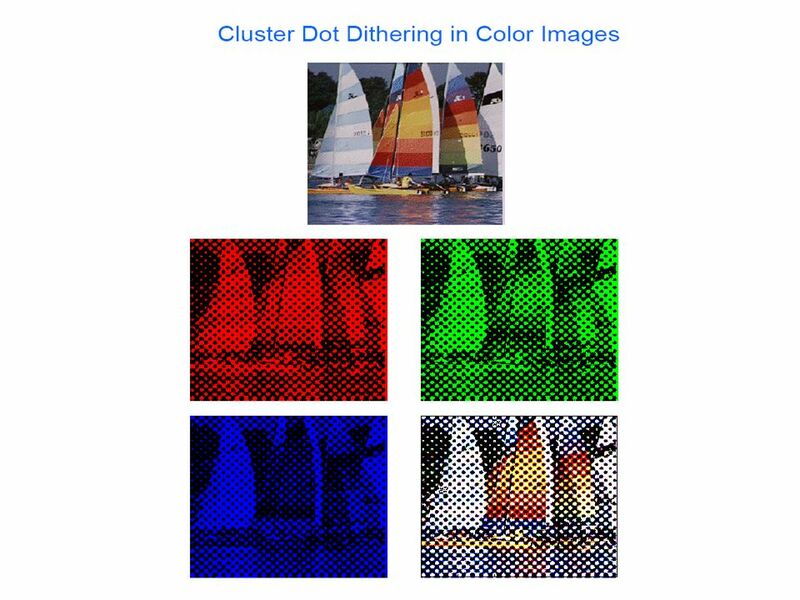 Color Mixing There are two ways to control how much red, green, and blue light reaches the eye: “Additive Mixing” Starting with black, the right amount. 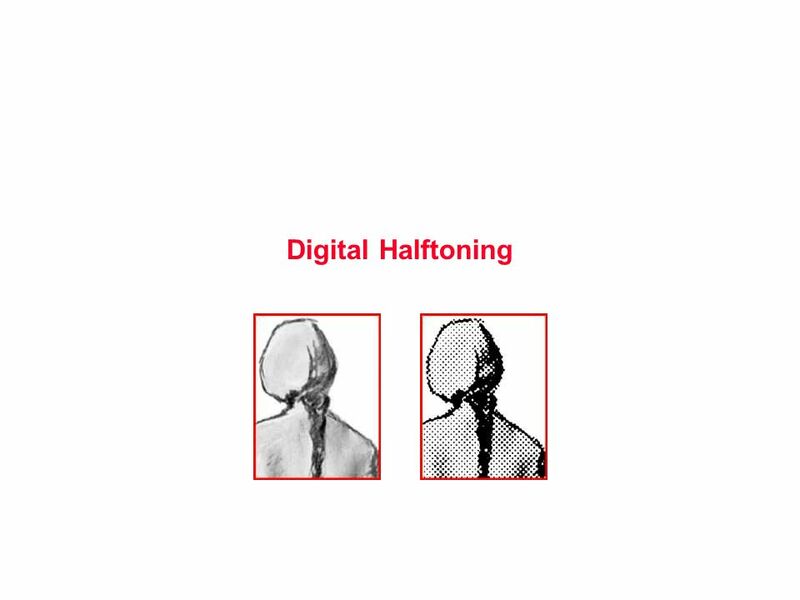 Half Toning. 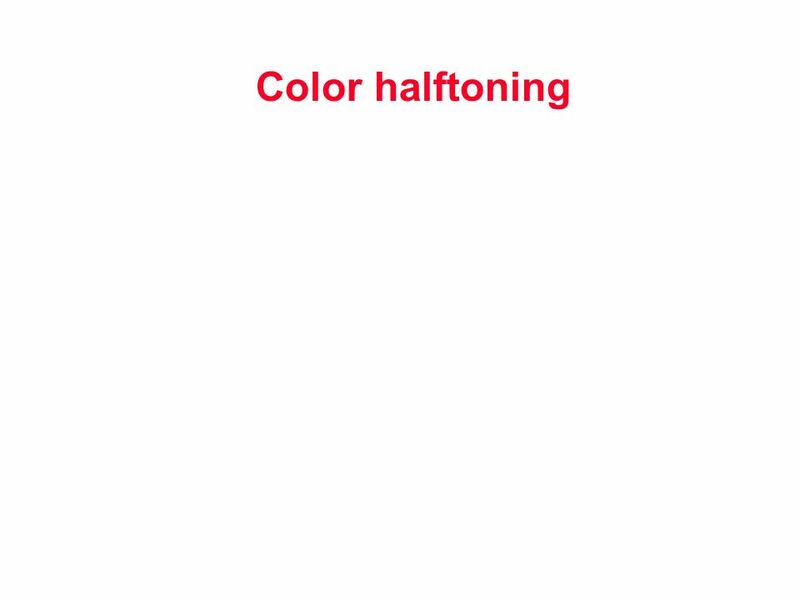 Continuous Half Toning Color Half Toning. 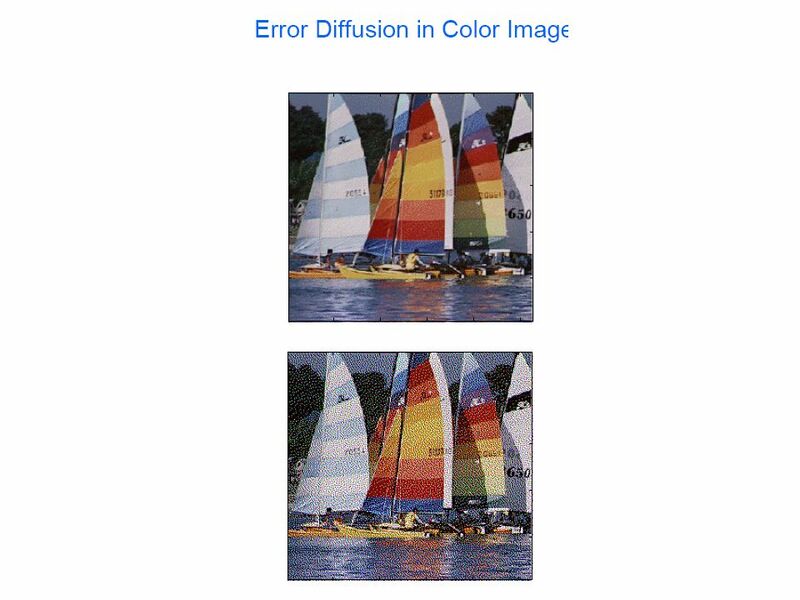 Color & Color Management. 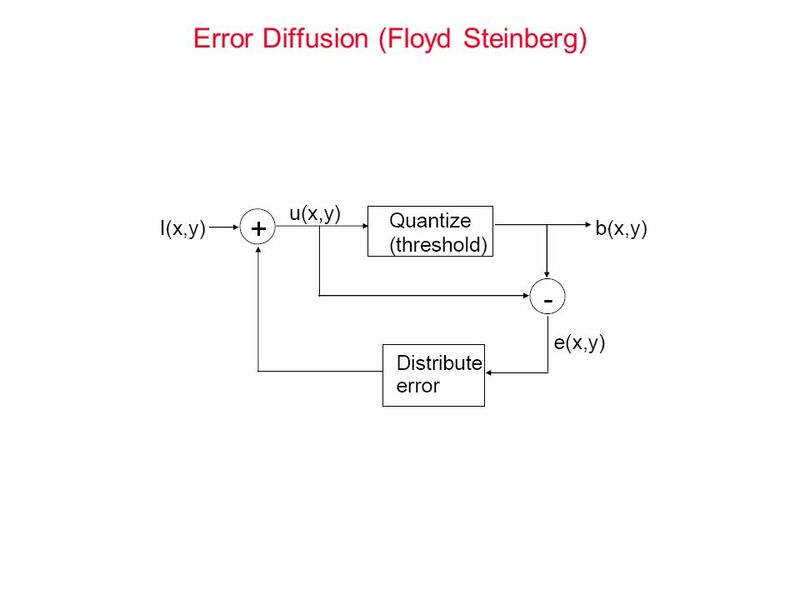 Overview I. 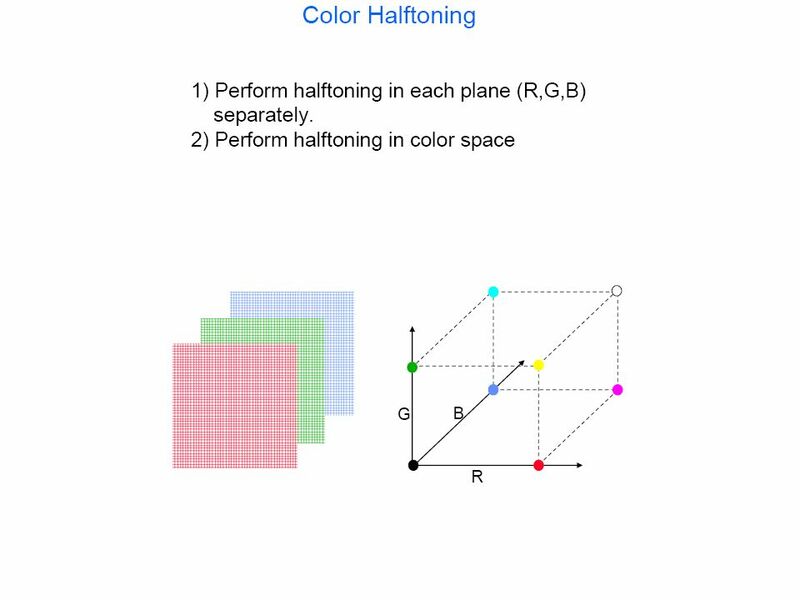 Color Perception Definition & characteristics of color II. 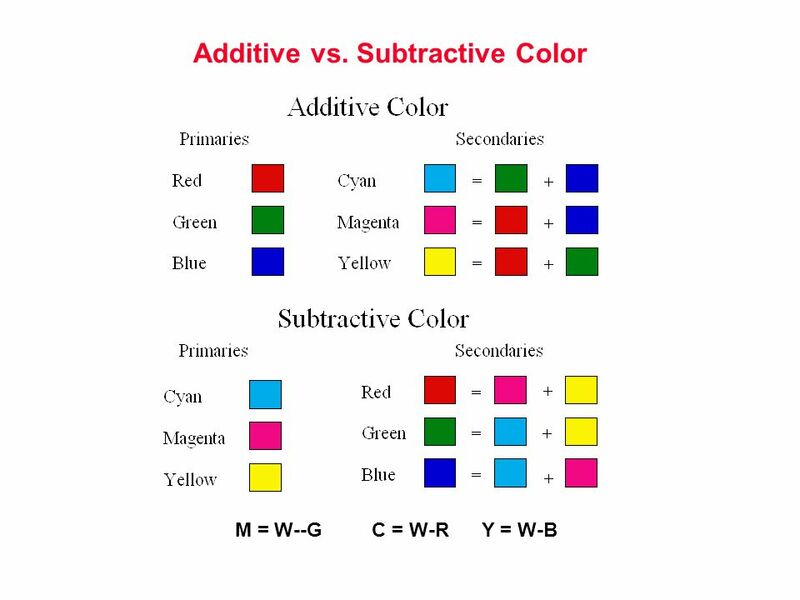 Color Representation RGB, CMYK, XYZ, Lab III. 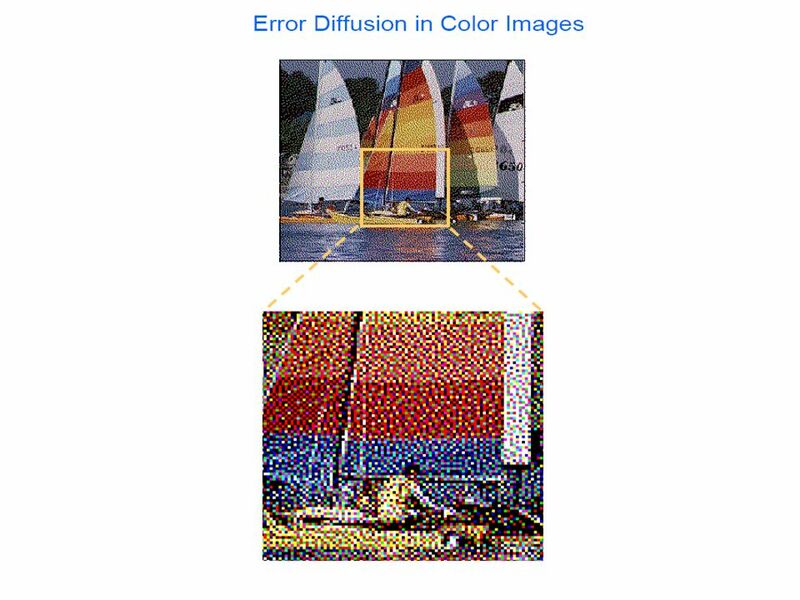 Color Management. 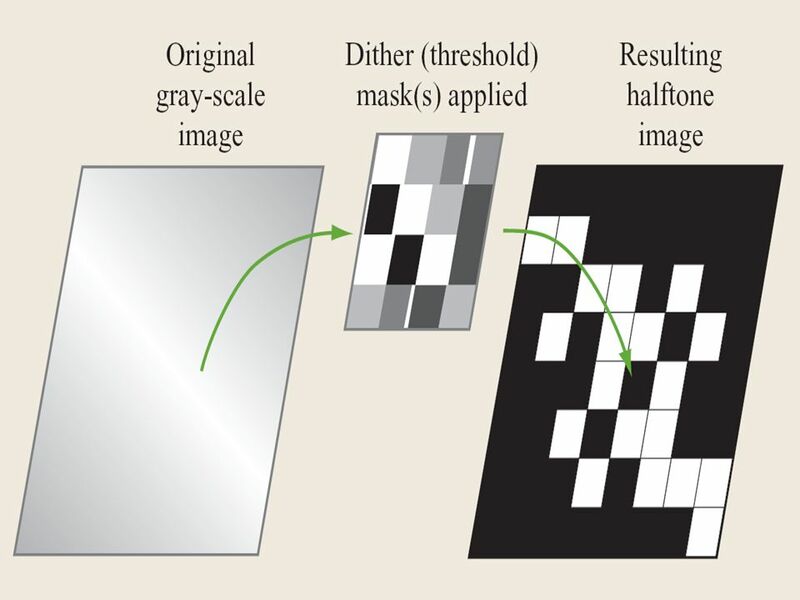 CHAPTER 8 Color and Texture Mapping © 2008 Cengage Learning EMEA.